A quick update of meals so far this week. Yummy and satisfying food! 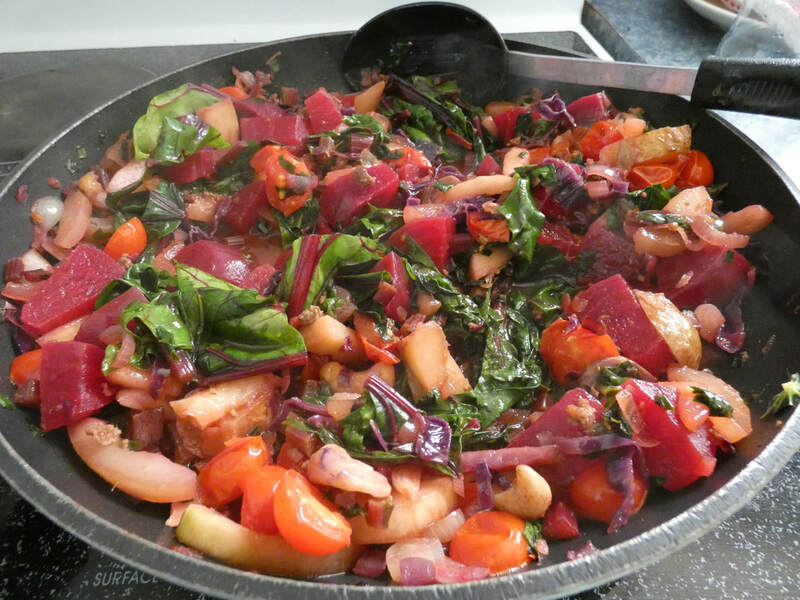 Monday's lunch: I pulled a large beetroot from the garden, cut it's leaves and stalks which I washed, chopped and set aside before peeling and chopping the beet, placing in a casserole dish, adding a spoonful of honey mixed with half a cup of water, and baking until tender. 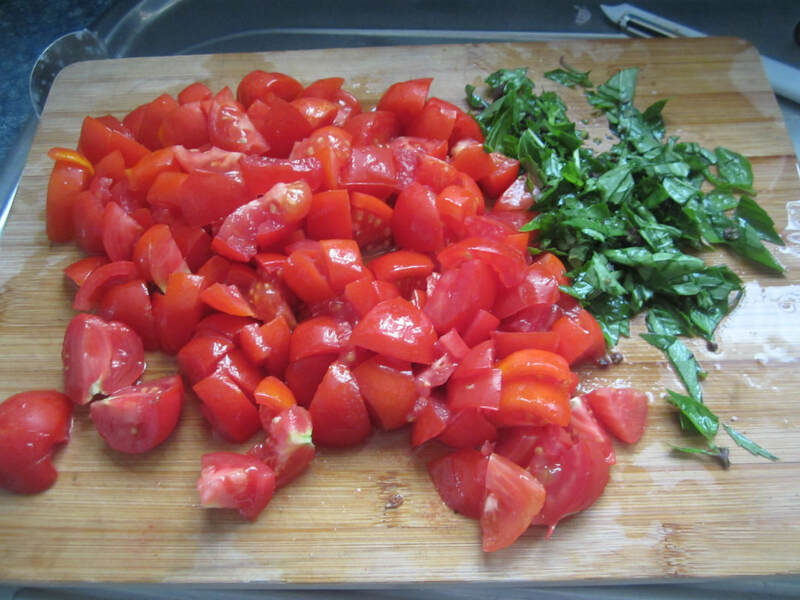 I then chopped up some shallots, peeled, deseeded and sliced most of a small marrow, and halved some cherry-sized tomtoes. I also chopped some parsley and chives, and made the decision to use up the two small spoonfuls of leftovers in the fridge - one of bolagnaise sauce, and one of cabbage and cashews. 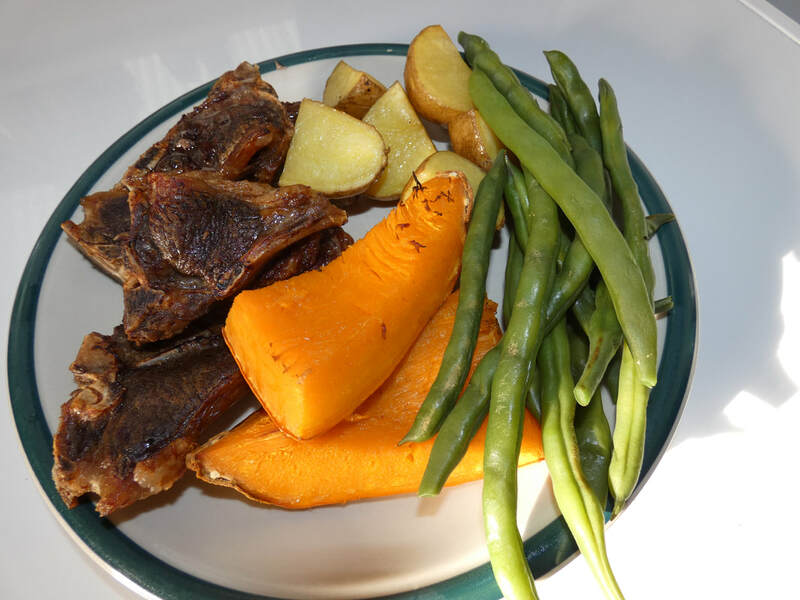 Monday's dinner: roasted new potatoes, baked lamb chops and pink banana jumbo squash (part of the last of last year's crop) with lightly cooked green beans. Tueday's lunch: left overs from the previous day - the beet-based lunch mixed with some chopped up roasted spuds and squash and left over beans, reheated in the frying pan. 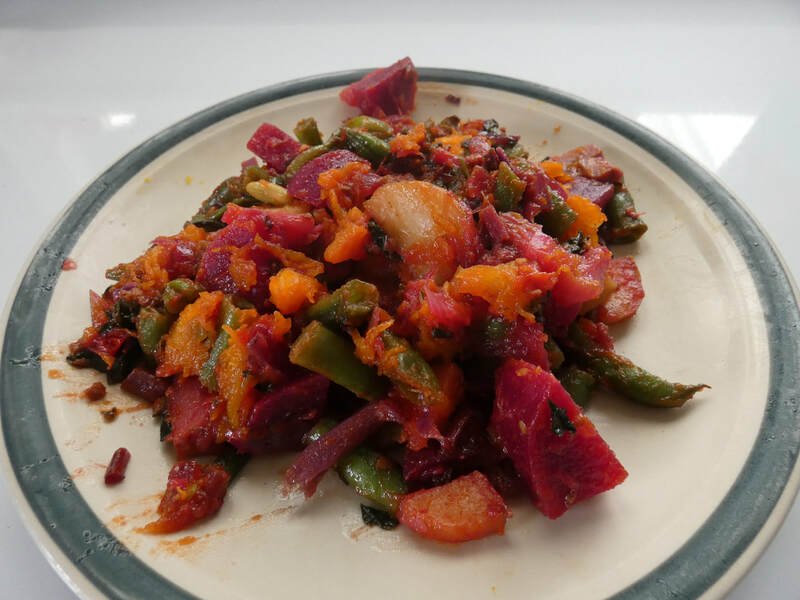 I find it's very useful to cook up extra veges such as squash, beets, potatoes etc when preparing meals, as they can be used in a myriad ways for other quick meals. My husband chose to have an omelete. Duck casserole (without the bacon in my usual recipe) on cauli rice, with green beans (they needed using up). 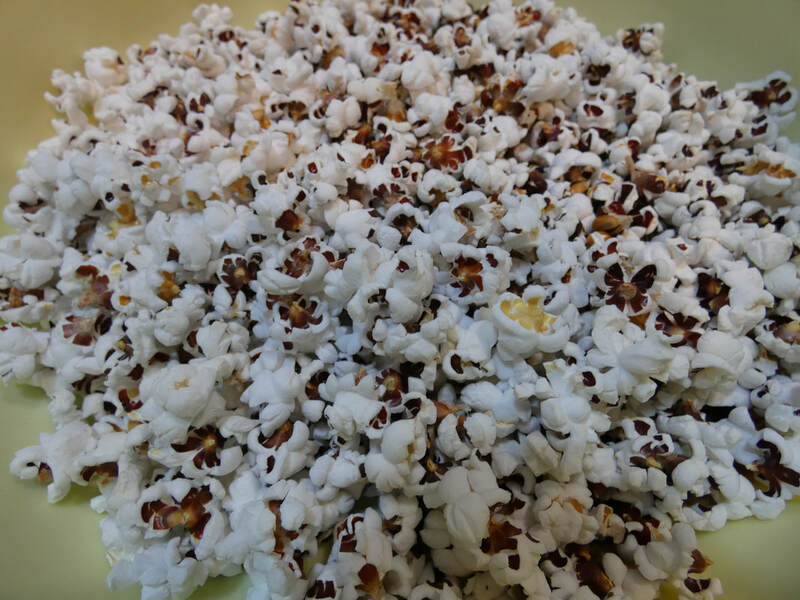 Snack: homegrown popcorn (mostly strawberry, with some yellow mixed in), popped in a hot air popper, and then tossed in some hot olive oil in a pot, and salted. YUM! 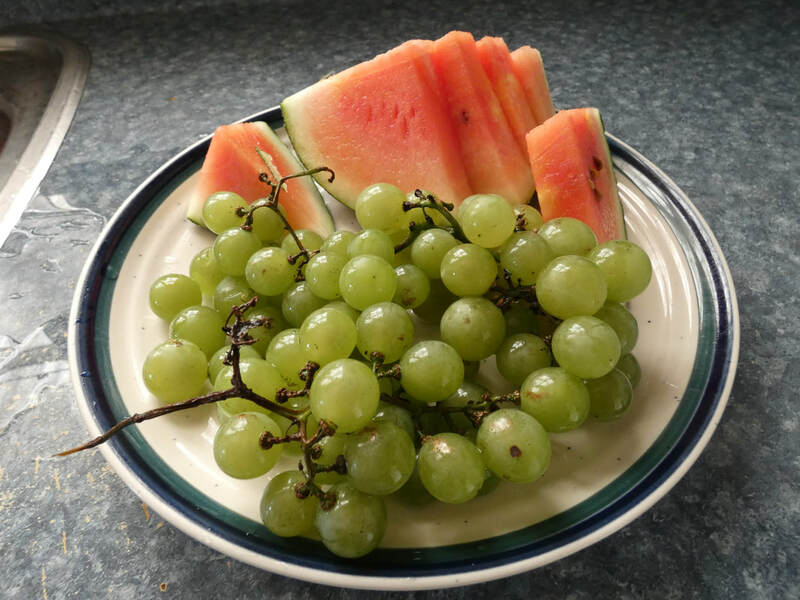 Other snacks: a handful of Chilean guavas, a few green beans straight off the vine, extra grapes, the odd apple or pear from our baby trees. 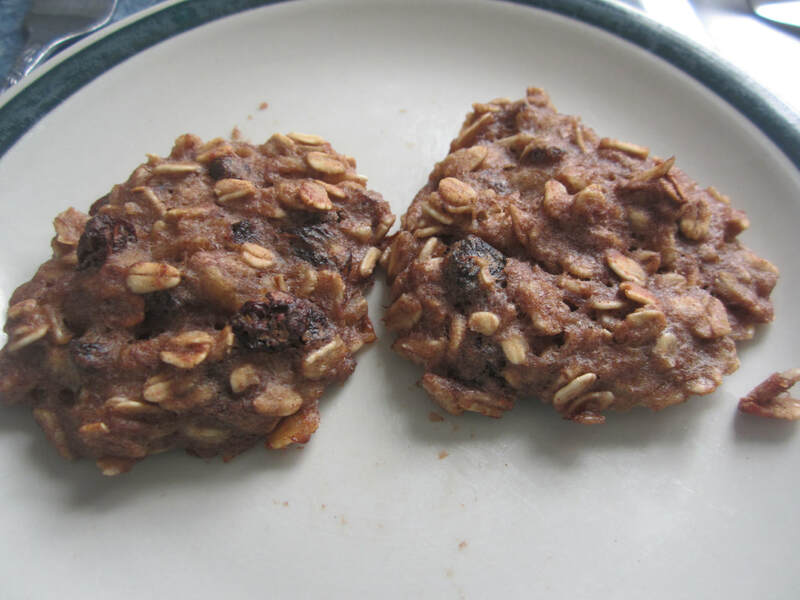 Wednesday's lunch: I baked some more pink banana jumbo squash until tender, then cut from skins and whizzed in food processor with enough water to make whizzing easy. I sauted a chopped onion (have decided it's ok to use the onions I have; could use shallots instead but I want to make them last longer) in some coconut oil until starting to caramelise, added some chicken stock and the pumpkin puree, and a handful each of chopped chives and nasturtium, plus some salt. Brought to the boil and simmered for a few minutes. Served with Tumbling Tom tomatoes. 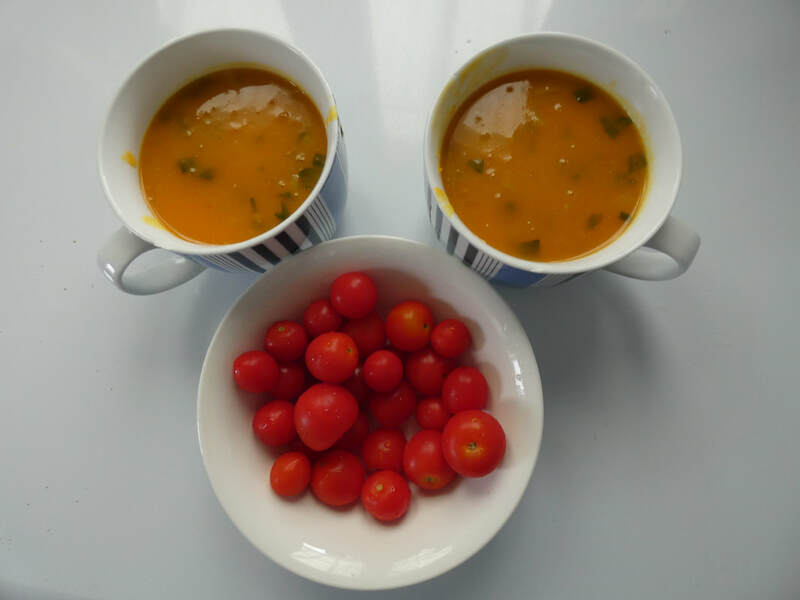 The contrast between a juicy, sweet, cold tomato and hot soup is very pleasant and interesting! 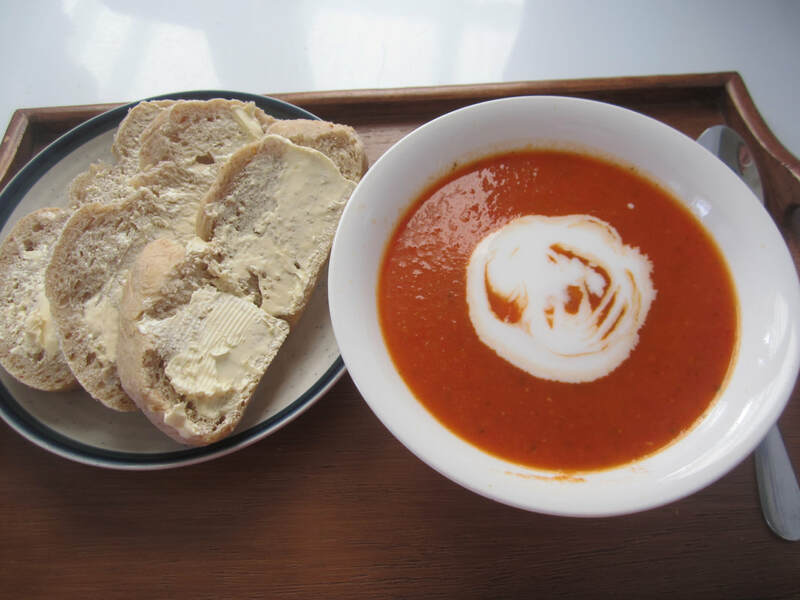 I ate a tomato after every few spoonfuls of soup. Wednesday's dinner: left over duck casserole heated in a pot with left over chopped roasted potatoes and chopped left over beans, and served on left over cauli rice, reheated by frying for a couple of minutes. That's it so far! 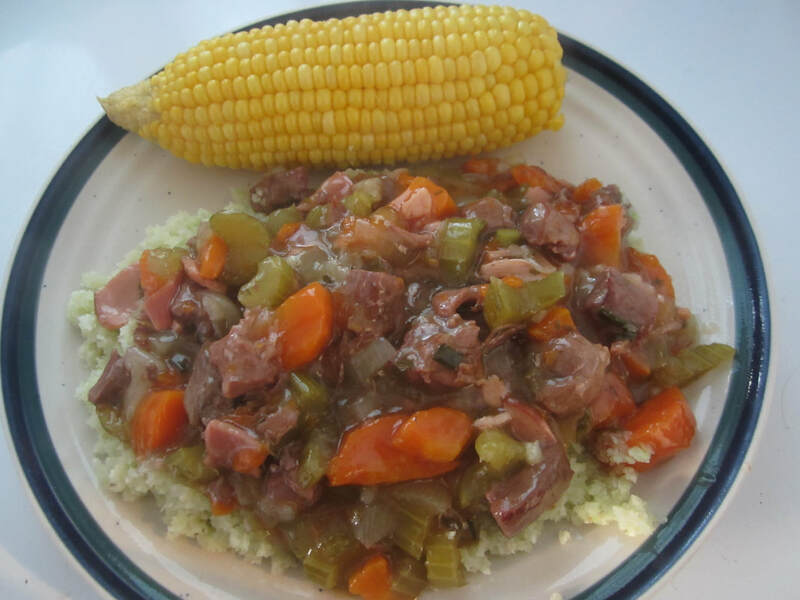 Coming up: I'm thinking of inventing a new spaghetti and meatballs dish, and I'm wondering if I can turn the dried Rainbow Inca corn I grew a while back into "grits" (essentially a corn porridge). I wonder if any of the neighbours have a suitable hand mill for rough-grinding of the corn? Watch this space! Starting tomorrow, my husband and I are setting out on a 2-week challenge. 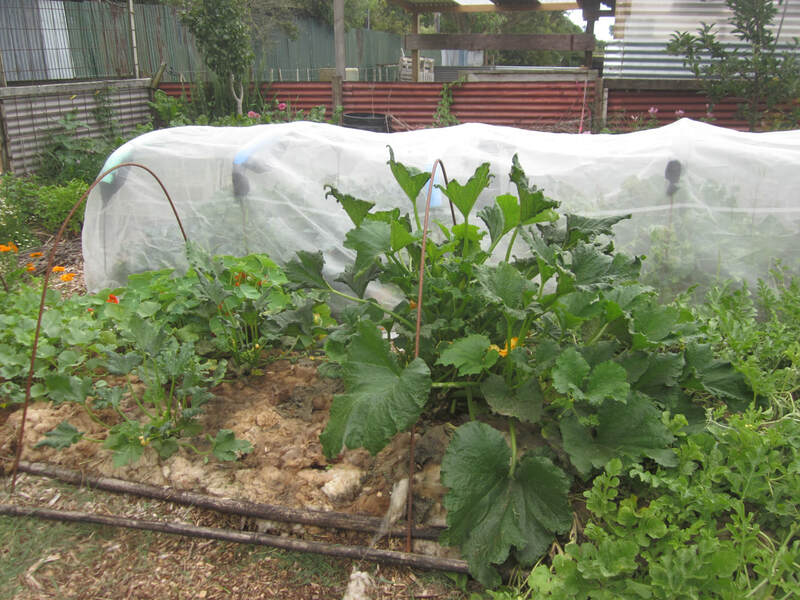 In week one, we'll eat only what we produce on the homestead (veges, fruit, weeds, honey, eggs, duck, lamb and chicken). 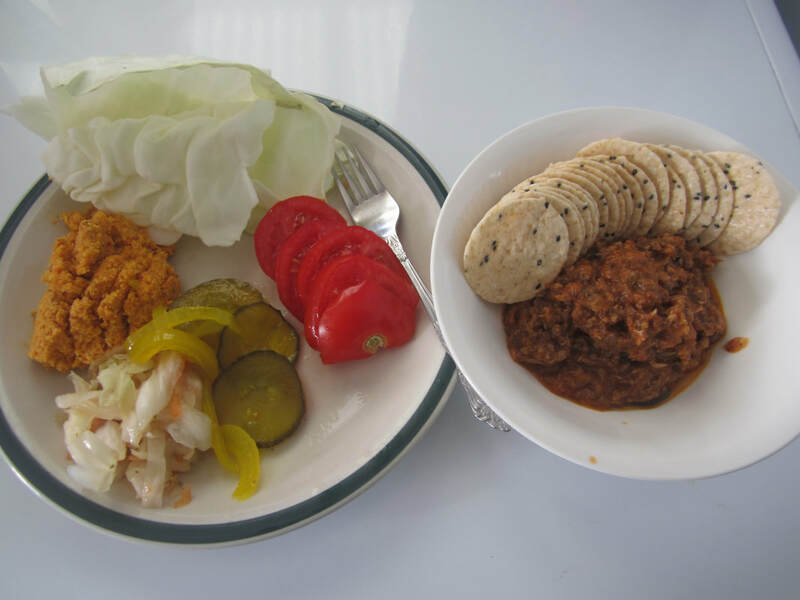 In week 2, we'll skip the animal products and eat only out of the garden. Exceptions: I'm allowing olive and coconut oils for cooking, and salt. I can use up already purchased produce with a limited shelf-life (carrots, celery, mushrooms). 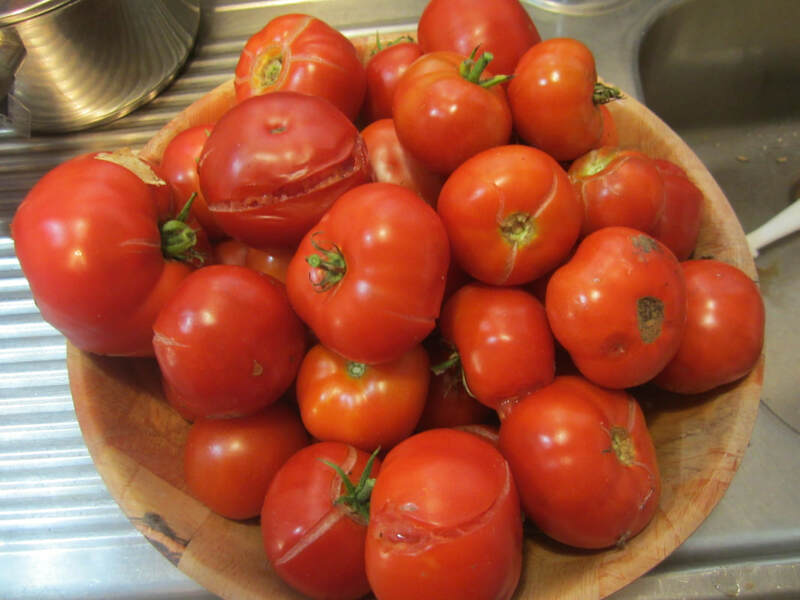 And I'm permitting my homemade pasta sauce (majority homegrown), and the applesauce made with our own apples (homegrown except for cinnamon), should I want to use them. 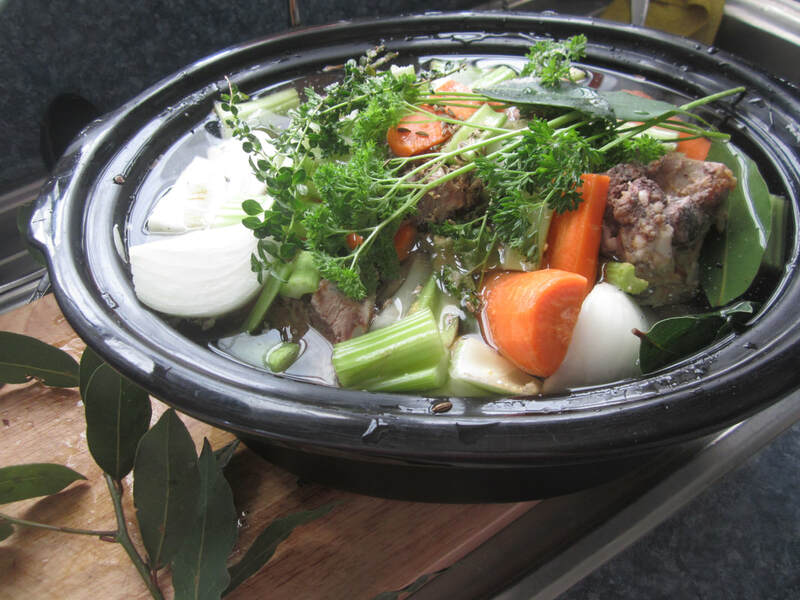 And homemade beef, lamb and chicken stock that are already in the freezer. I may also allow some naturally-fermented soy sauce if we really need it for flavouring, but we'll see. That's it! Why this challenge? 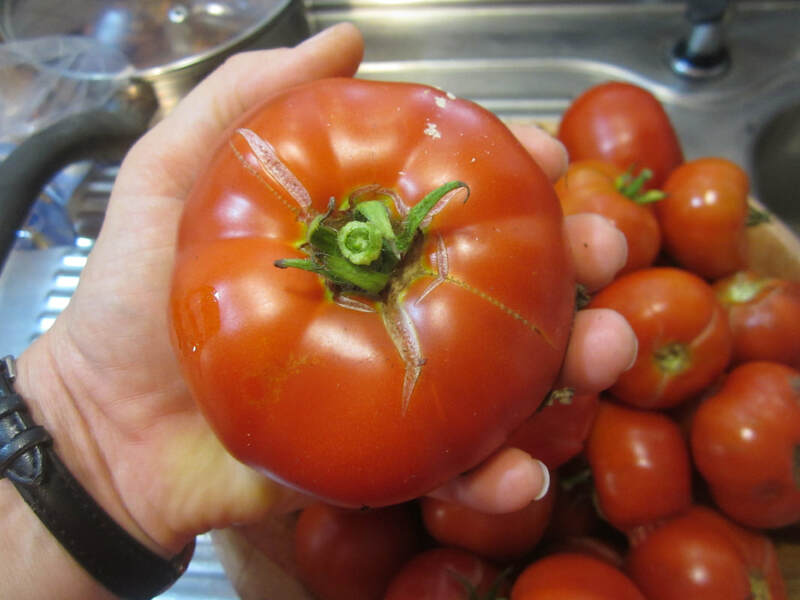 There's lots to eat in the garden, and I've been wanting to get to the stage where we live off the homestead as much as possible. Old habits die hard and all that - so need a kick start to eating off our little block. 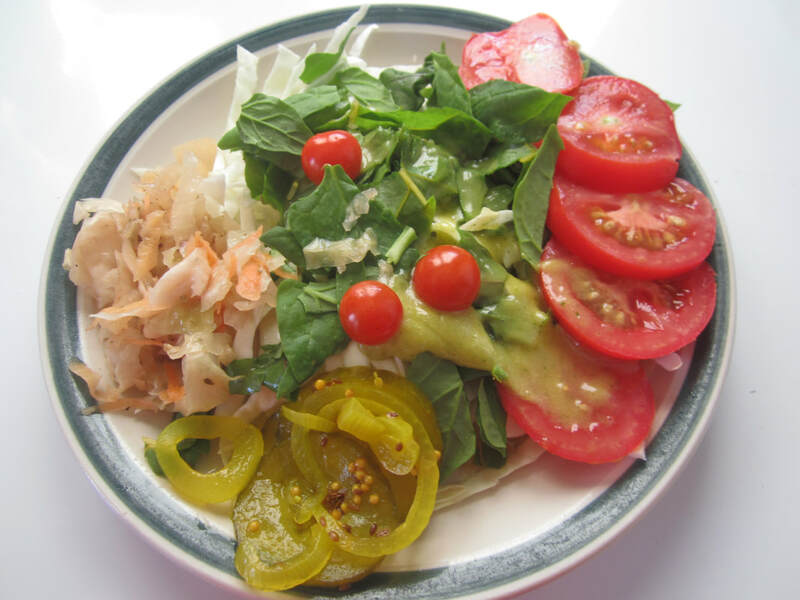 Plus it's time to get back on track with healthy eating in general. Post SN2N Challenge: Spending Up Large - NOT! When I finally left to go grocery shopping, my list had a meagre 14 items on it. And I actually only ended up buying 8 of them. The others either weren't at a price I liked, out of stock, or I decided I just don't need them after all. 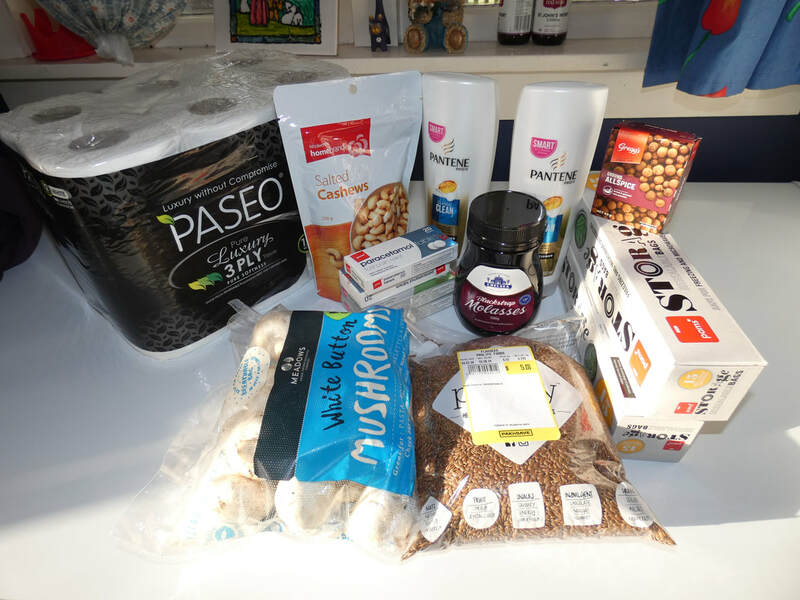 Before I made my list, I fully expected to do a "proper" grocery shop and spend around $400. Nothing unusual in that for a fortnight's groceries (taking into consideration multiple food intolerances, and my lack of adjusting to all the kids being gone). Instead, I spent......$58.99. And $10 was basically "treat" food (I really wanted some mushrooms and cashew nuts so I could make THIS yummy dish again.) 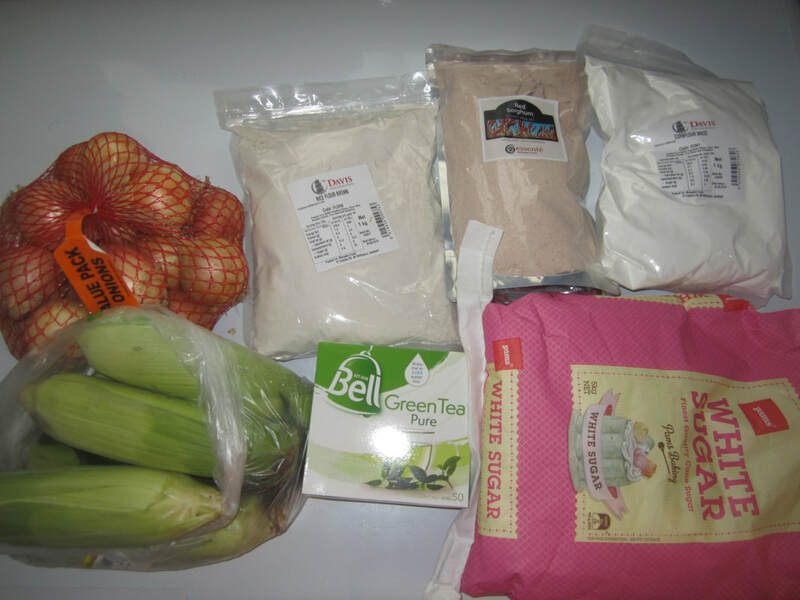 The pic below shows what I bought. I really, really couldn't think of anything else we needed! (My husband says there's STILL too much food in the fridge lol). 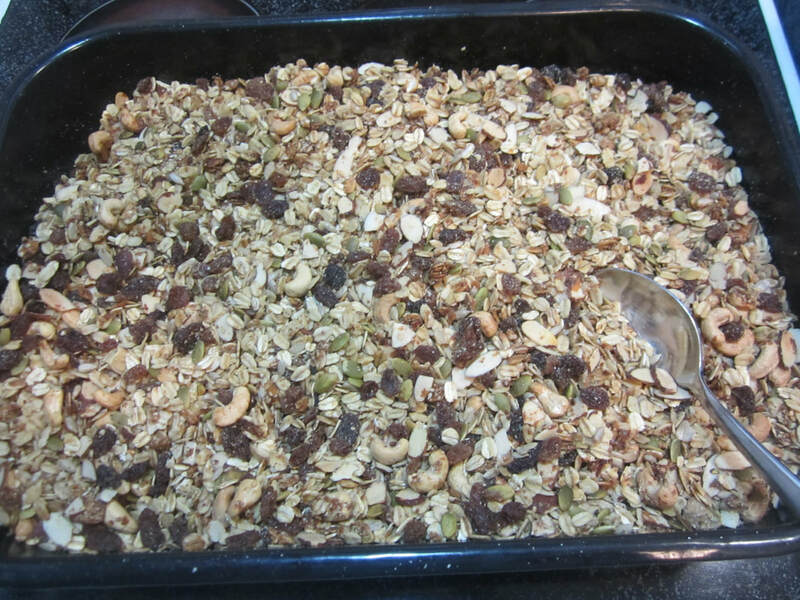 ​The linseed, allspice and molasses are ingredients for museli and preserving that I had noted I was runnnig low on. 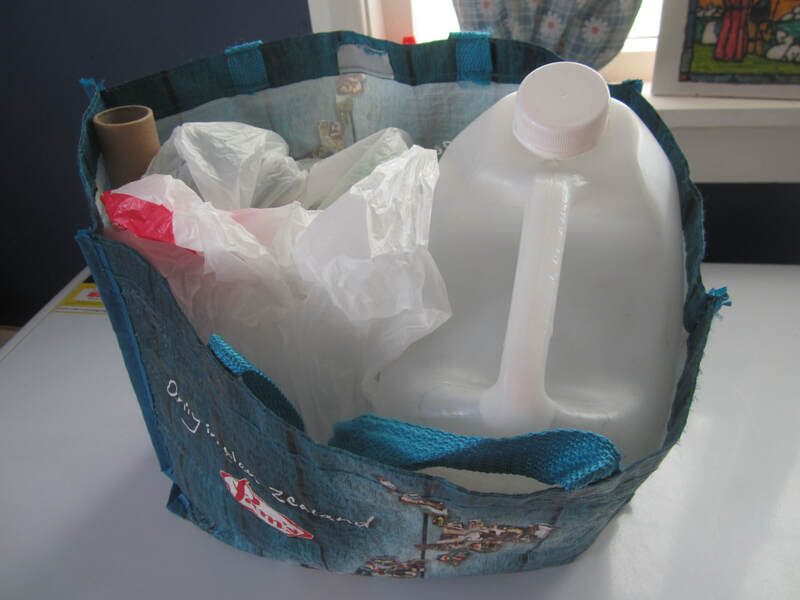 The ziplock bags...I want to get where we don't use any such bags, but I'm not quite there yet. Conditioner...because I'm not in the headspace to experiment with alternatives for that right now. TP - obvious ;-). Some pain relief for our medicine cabinet - also something I would like to permanently eliminate down the track. The days ahead will be interesting! Especially as I have a new challenge in mind - starting tomorrow! I love roast lamb! 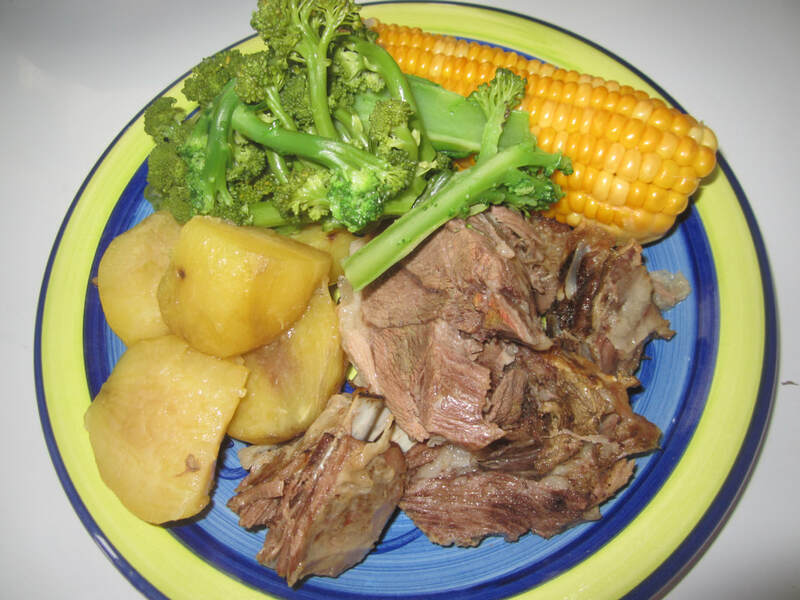 I cooked up the second to last roast in the freezer and we enjoyed it with broccoli, sweetcorn and kumara. The sweetcorn was from last year's garden, or maybe the year before (blanched and frozen). I think I'll turn the rest that is in the freezer into soup or something - it's just not at nice as fresh! The broccoli was fresh from the garden - still lots of it growing on the plants I planted in the greenhouse last winter, as well as more on the younger plants in the garden. Kumara was on special for $3.99/kg, but can't wait to harvest some of our own soon! 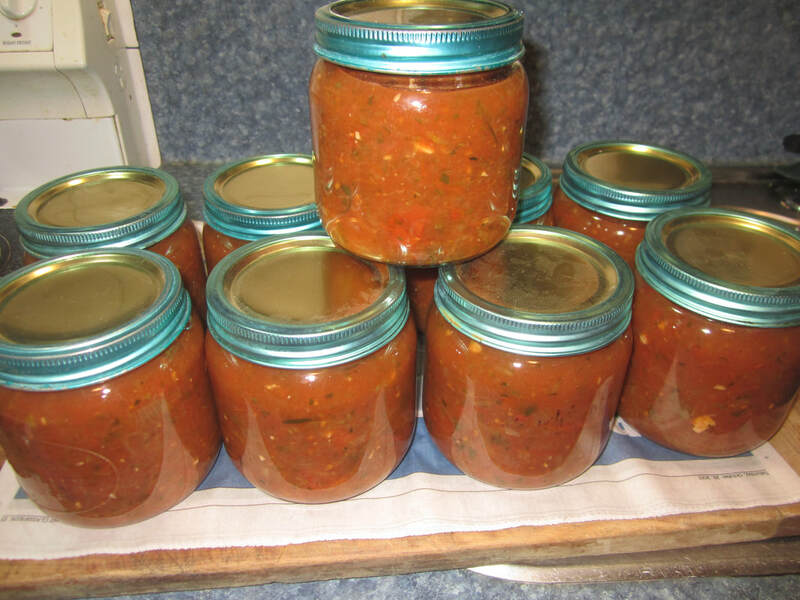 I used up some fresh tomatoes and a big marrow, along with handfuls of lovely fresh herbs, and made another batch of Garden Goodies Pasta Sauce. Mmmmmmm! 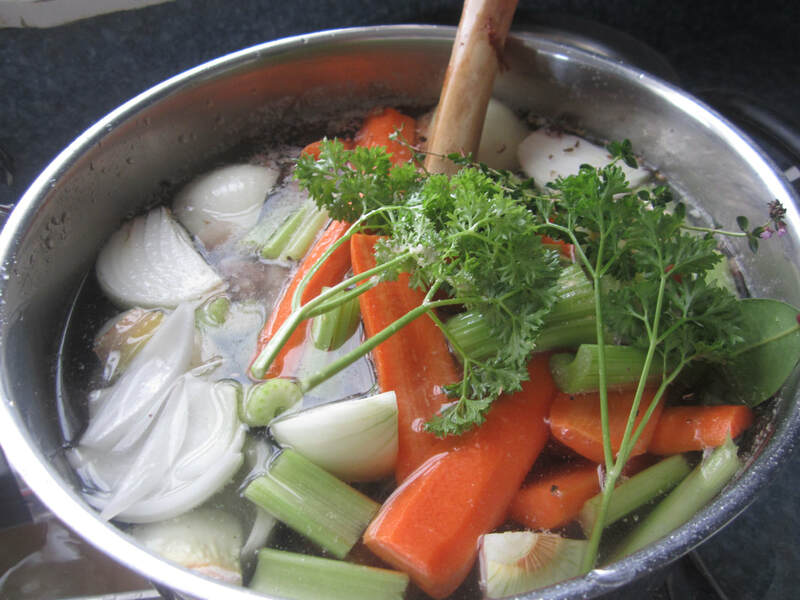 Not actually a lot else to report in the kitchen this week - I've been mostly cooking the same things I've posted about before, and didn't have time for any experimentation. The seasons are definitely turning! February started off cold, but then has had some hot days again. This past week though it's been noticeably colder. I've been tempted several times to light the fire! Well, this past summer started off earlier and hotter than it has in some years, so I guess it's only natural that autumn would follow on without delay. 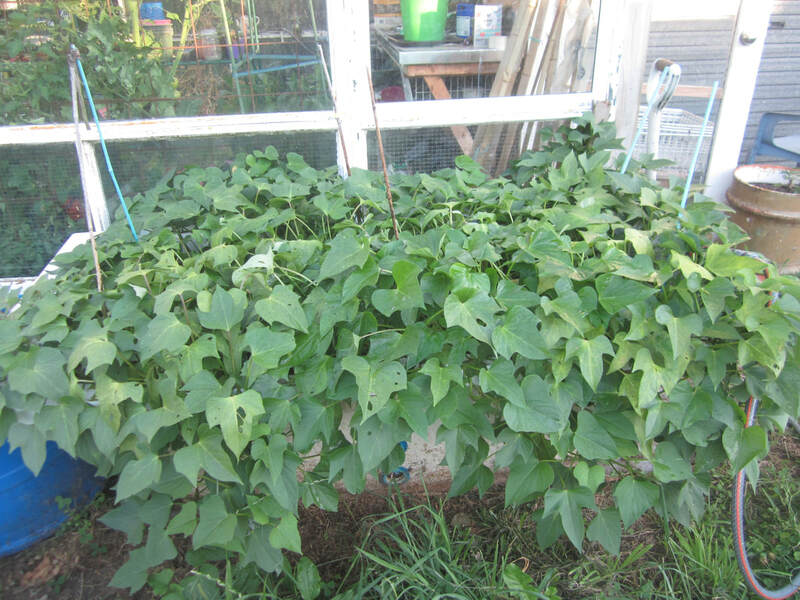 The beans have slowed down, the squash have all suddenly got mildew - both sure signs that the end of the season is here. My thoughts are turning to cosy fires, stores of pumpkins and squash, knitting for my soon-to-be-born second grandbaby, warm soups, shorter days.....but in the meantime there's still a lot to be done! 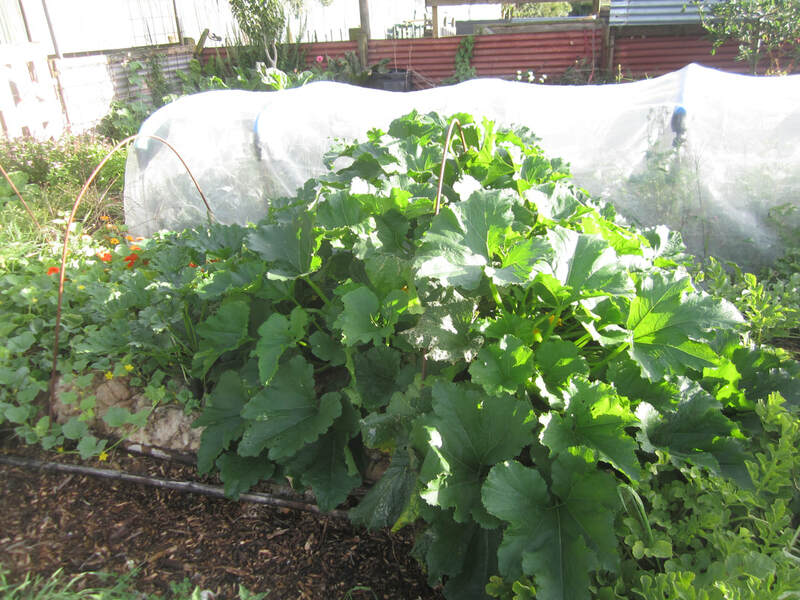 A sea-change in the pumpkin/squash patch. It went from very lush and green to mildewed and dying in the space of only a few days. This is normal for this time of year - the weather cools, and the plants declare "I'm about done!" 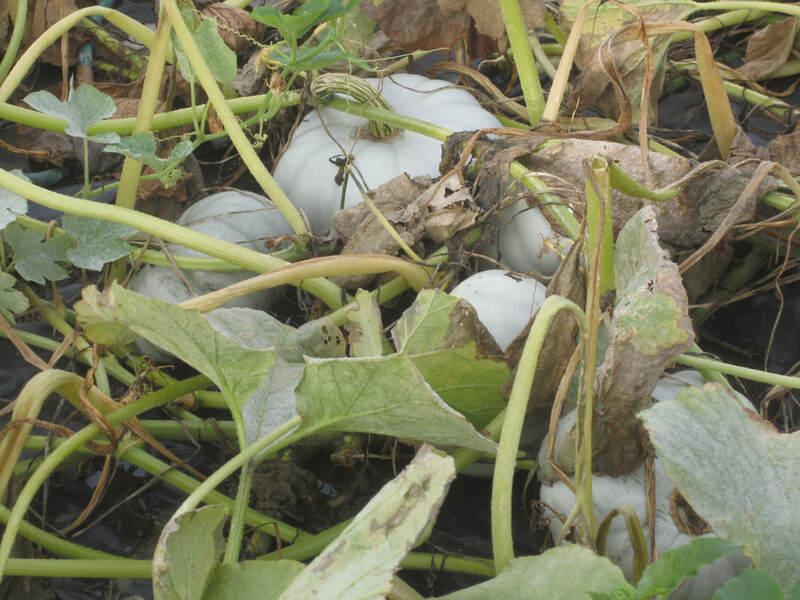 My first season in the garden, I spent time googling powdery mildew on pumpkin plants when this happened, and read all this advice that said it would affect the flavour and storage of the pumpkins, and that I should remove the worst affected leaves and spray the rest with a baking soda/milk combo. Which I did. Total waste of time! Since then I've accepted that this is a normal part of the progress of the seasons; happens every year, and every year my matured squash are just fine! Yeah, there may be a few fruit that had gotten started late that will never properly mature, but that's no biggie. 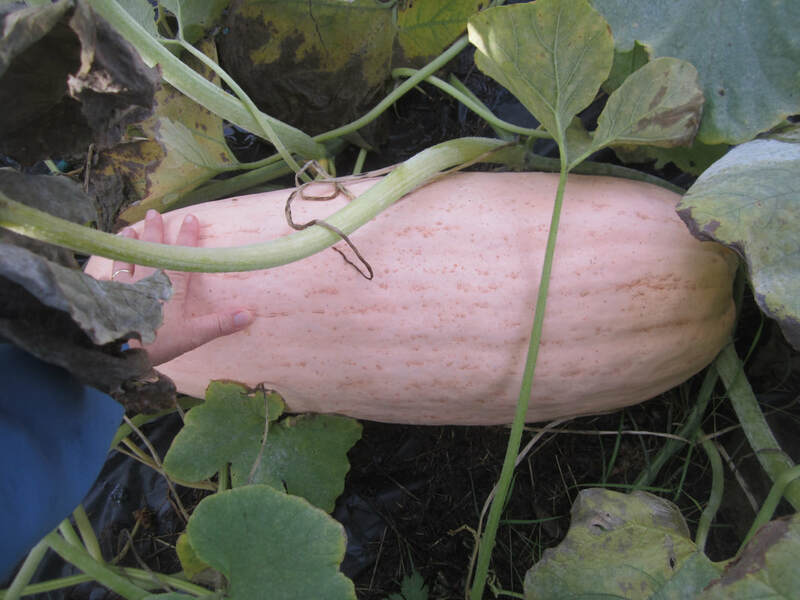 There's plenty of good big pumpkins and squash in there! In fact, that's the exciting thing about when this starts to happen - I start to get a glimpse of just what the harvest is going to be like! 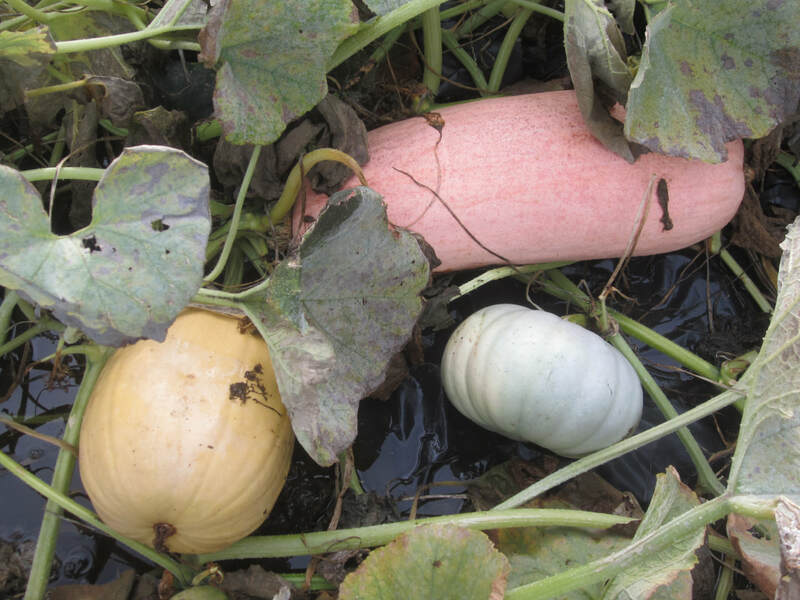 Pink banana jumbo squash are the stars of the season - I only planted three plants, but they're everywhere! And most of them are whoopers! I also have crown pumpkins, buttercups, butternuts, and spaghetti squash. All the plants are intermingled - below is a pink banana jumbo, and crown pumpkin, and something that's supposed to be a spaghetti squash, but I suspect that one of the seeds I planted was either mis-packeted or had crossed with something (bought seed) - so will be interesting to see how that one tastes! 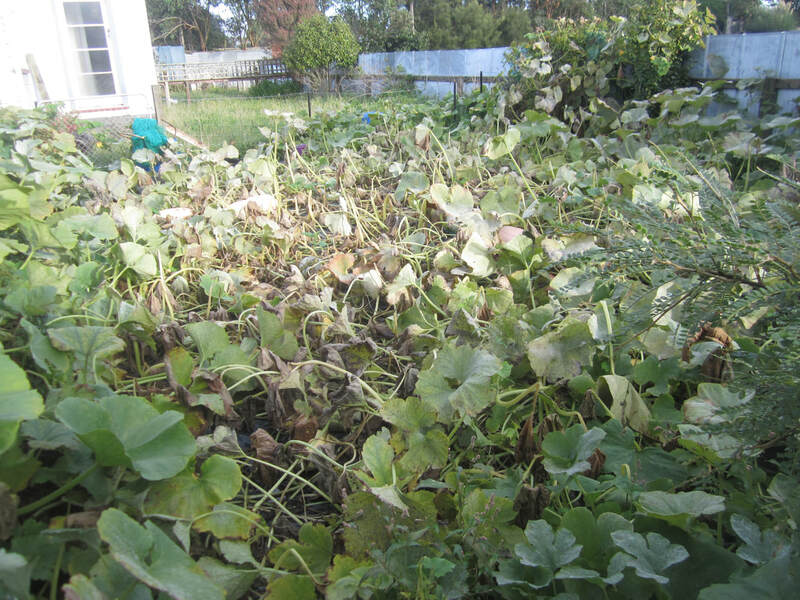 Probably time to start harvesting some of the squash - will take a closer look tomorrow. I need to start picking the grapes too! 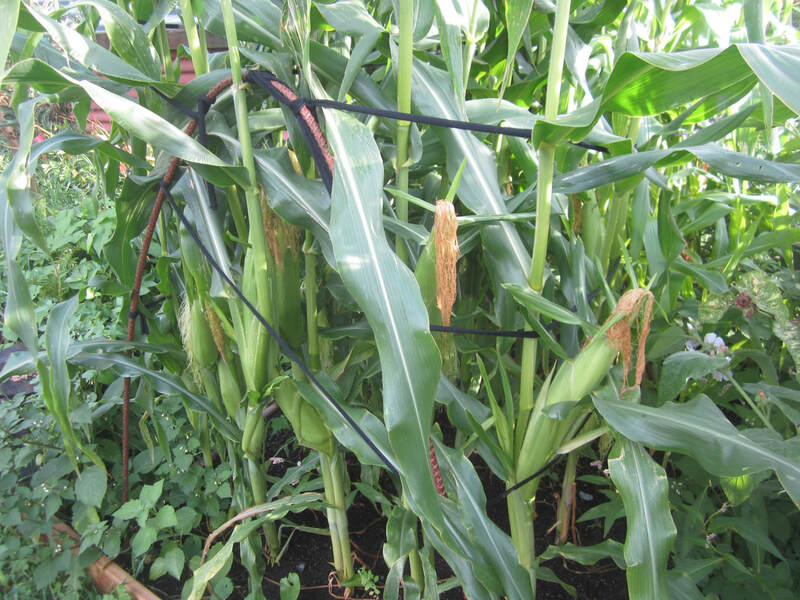 Won't be long until the first of the sweetcorn is ready to pick (and eat!). 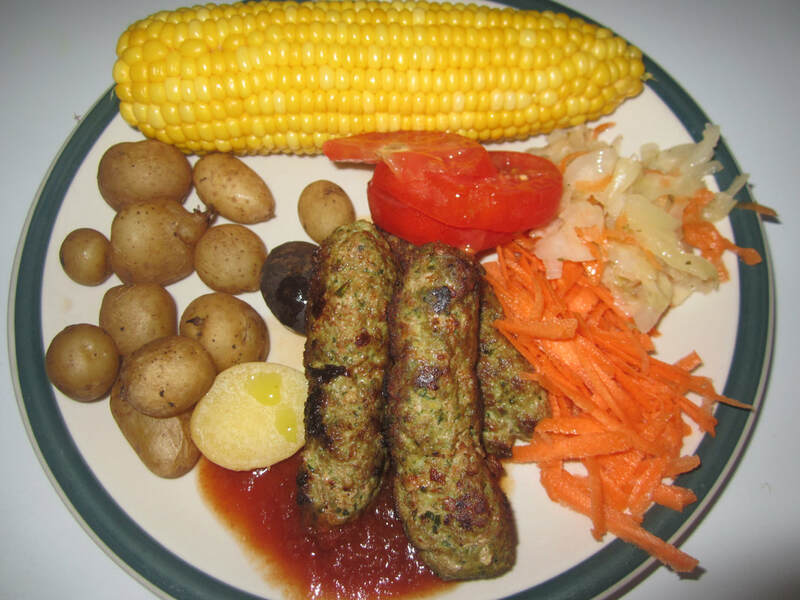 Ideally, corn is picked, cooked and eaten within the shortest possible time. I planted the patch in two halves - the second half is just starting to pollinate, so, if the weather holds, we should have corn for a while. 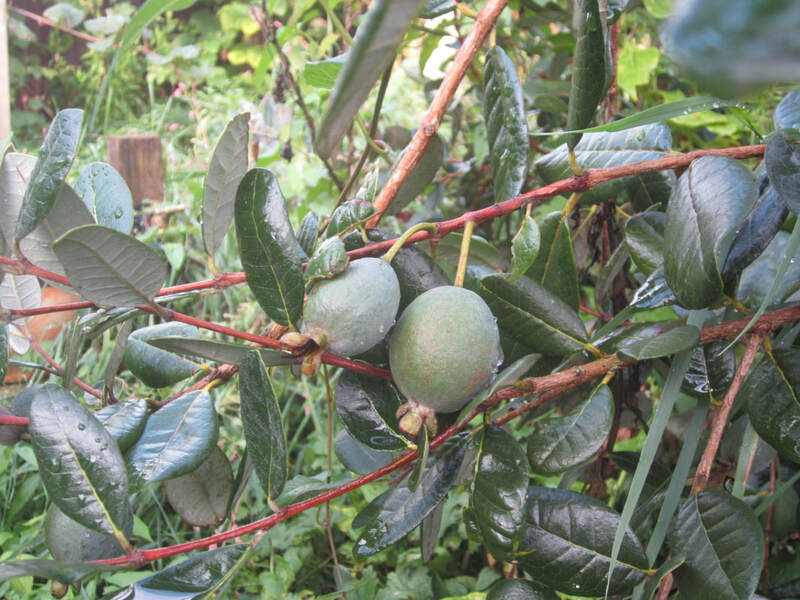 Apples are ripening, and the first of the Chilean Guavas are ready to pick. 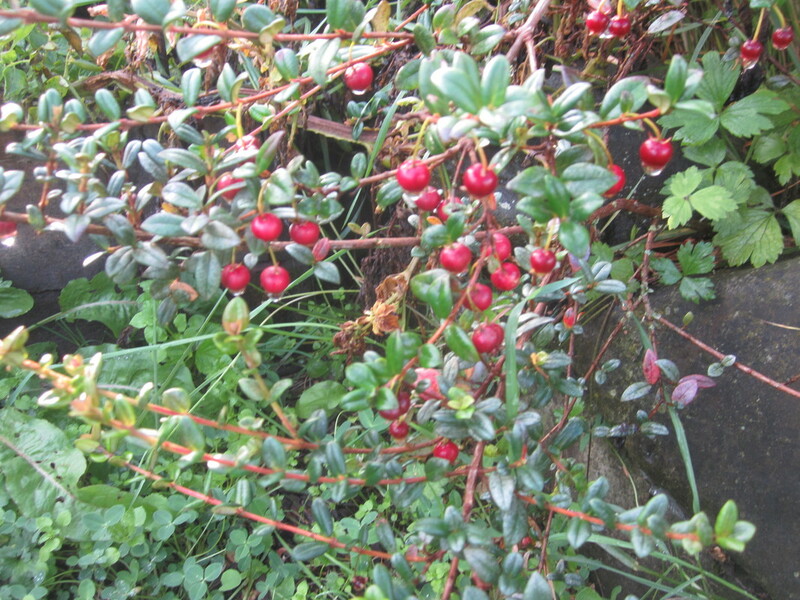 Just LOVE the fragrance and taste of the Chilean Guavas - and best of all, the birds ignore them. 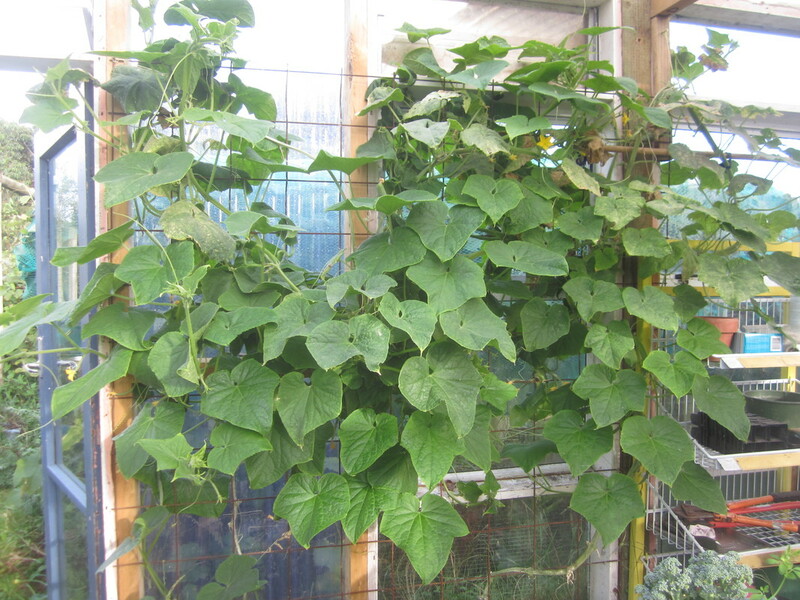 The cucumbers in the greenhouse have found a new lease of life since I fed them with some Thrive (they were dying off), and there are lots of new cucumbers forming. Some of this year's watermelons look like they could be my biggest ever. 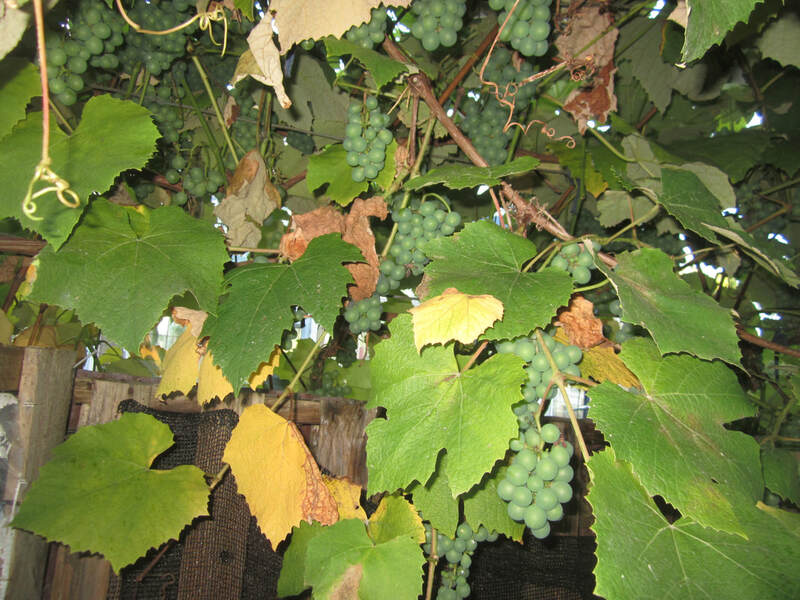 A few, on the other hand, have had the vines they're attached to die off without maturing. Can't wait to bite into some of this juicy sweetness! Plenty of silverbeet or rainbow chard. 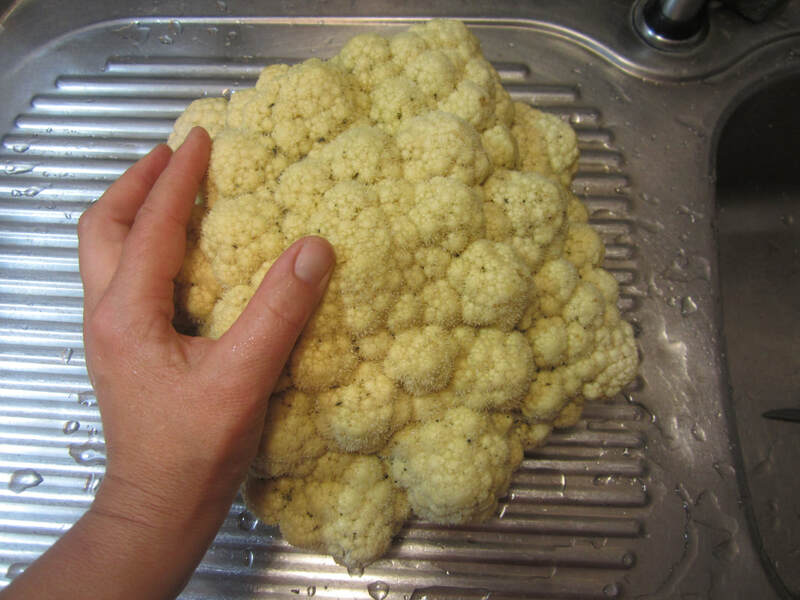 Another big healthy cauliflower. Folk in the FB NZ vege gardener's group were complaining that caulis are $9.99 each in stores at the moment! Crazy! Growers are complaining that this year's humid weather has brought rampant fungal diseases etc to a lot of crops, especially leafy greens, thus driving prices still higher to come. With one thing and another, there's no better time to be growing your own. And a key is to grow a diversity! In a commercial mono-culture, if the crop fails, well that's it. 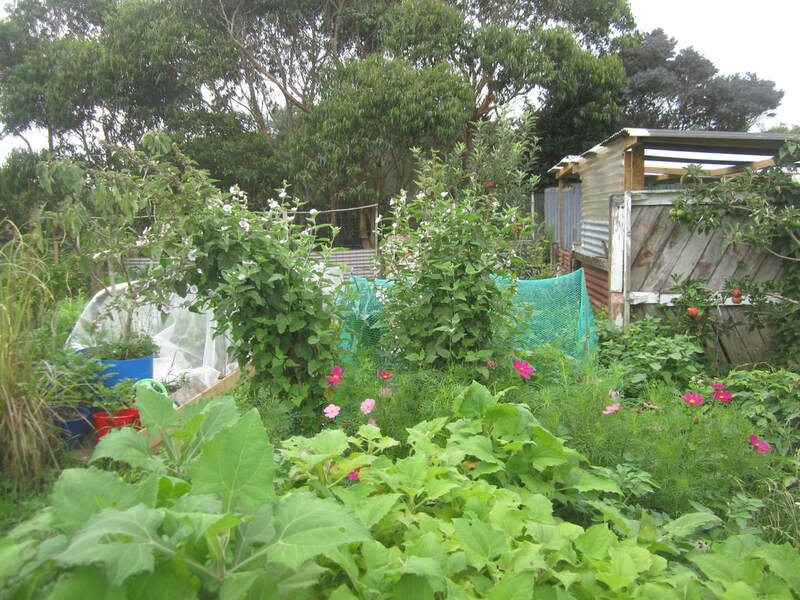 But in a diverse backyard garden, if my potatoes fail, I can still eat yacon and kumara and dahlia and canna lilly tubers. If there's no broccoli, there's still silverbeet and beans. And so on. 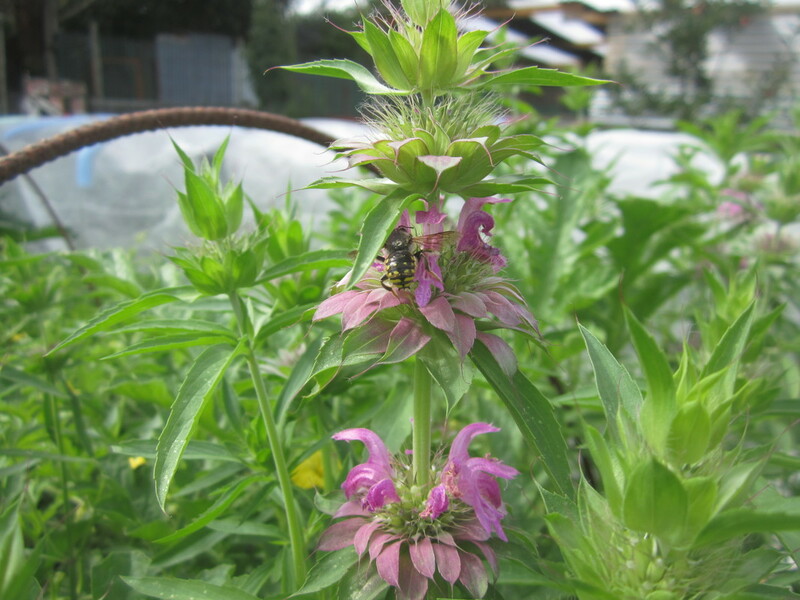 Plus the bigger the diversity, the wider the numbers of beneficial insects to keep the bad bugs and in some cases diseases under control. Every time I pick kale, I check for praying mantises on the leaves, and return them to the plants - those guys are keeping the white butterfly caterpillars and whitefly under control! 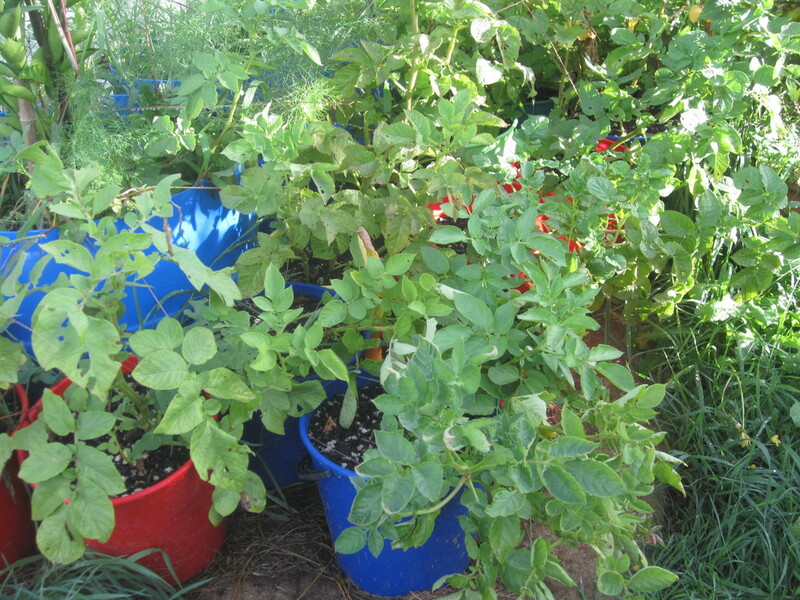 Potatoes in buckets. I've got spuds in two different garden beds, as well as quite a few that have popped up in my yacon and strawberry patches. And these guys in buckets. 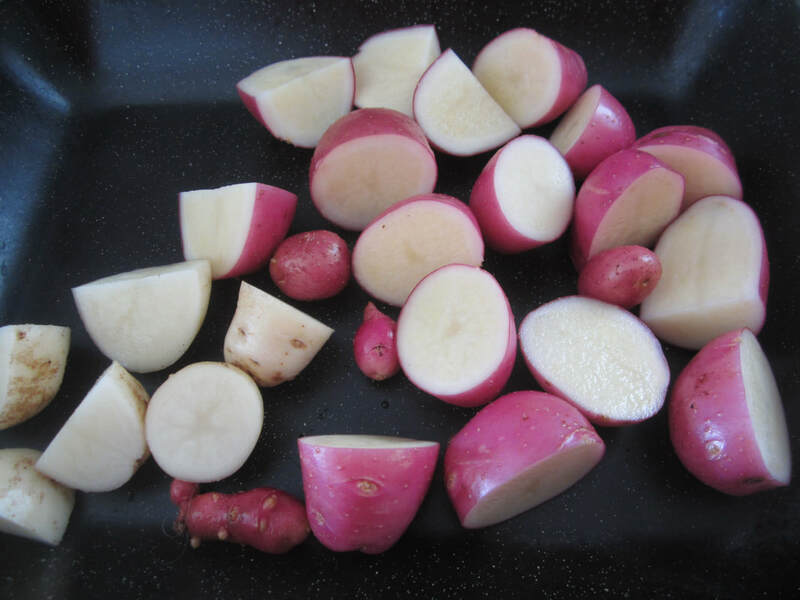 Quite a few different varieties, two small potatoes from last year's crop in each bucket. Cheap-as potting mix, no extra feeding. Looking forward to seeing what is produced. 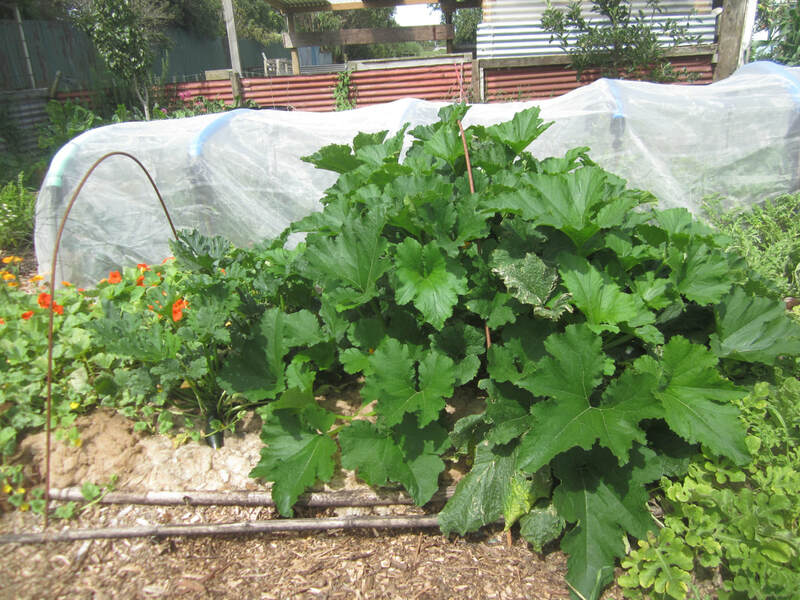 The zucchini I sprayed with silverbeet water getting bigger and bigger! Must pick more zucchini. 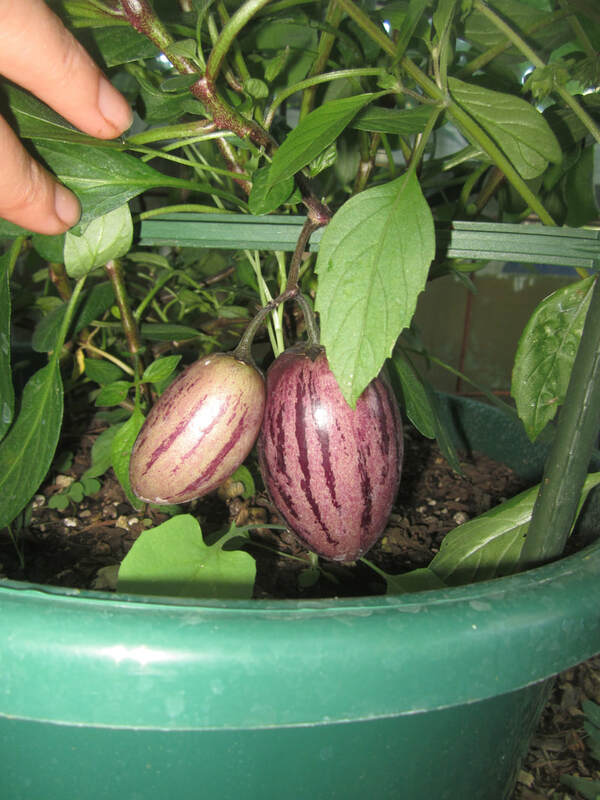 These are banana melon vines. 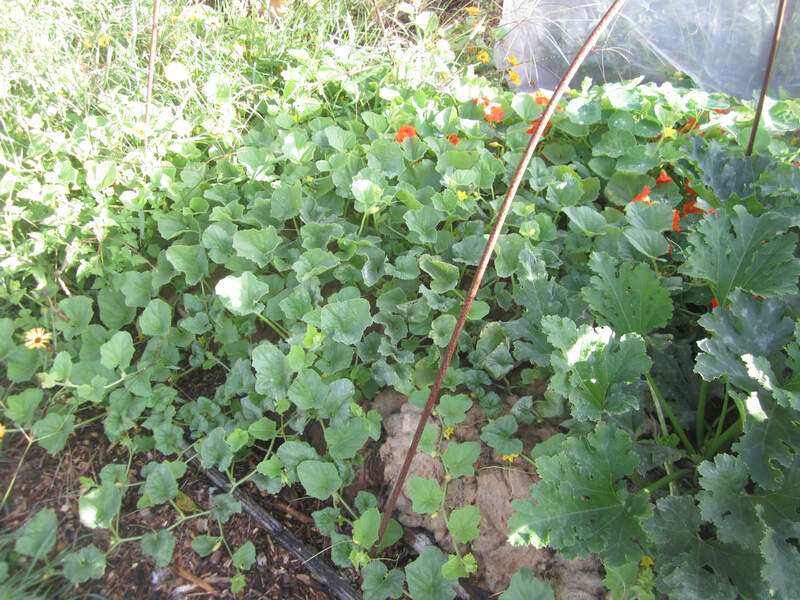 Looking healthy, but not sure I'm going to get any melons at all this season - should have planted them earlier, or kept them in the greenhouse. Ah well. First time trying this variety. Choko vine - nowhere near as big as I would hope this time of the year. 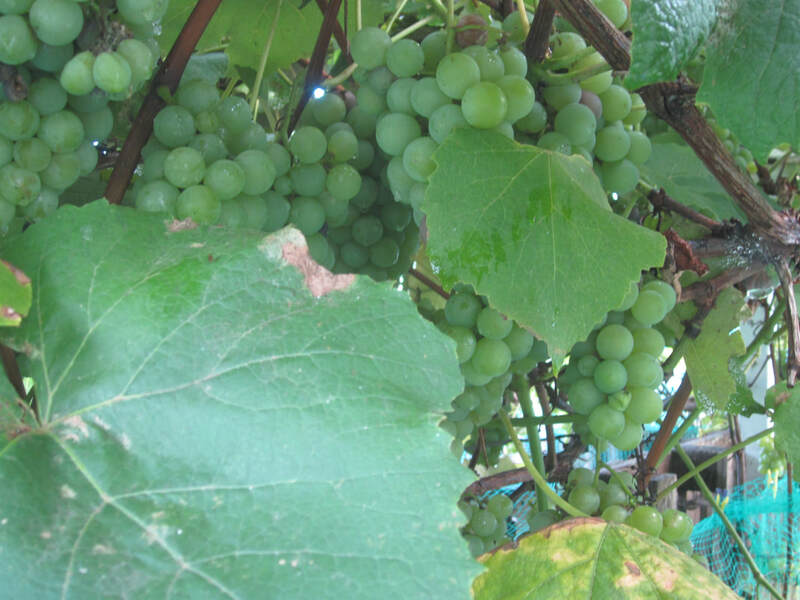 Will be pleased if I just get a couple of fruit to start new vines for next year. We'll see. Lots of feijoas on my four young trees. 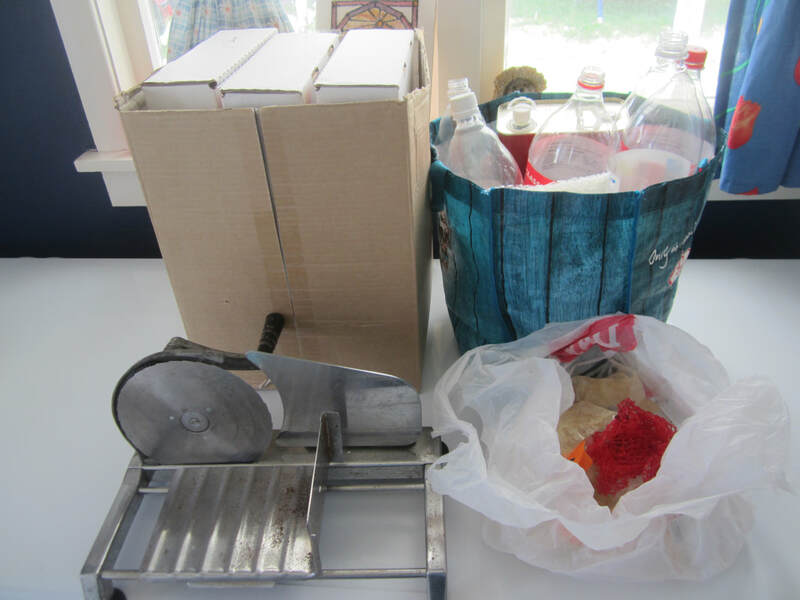 Looking foward to them - and to making a new batch of feijoa fizz fermented drink from the skins. 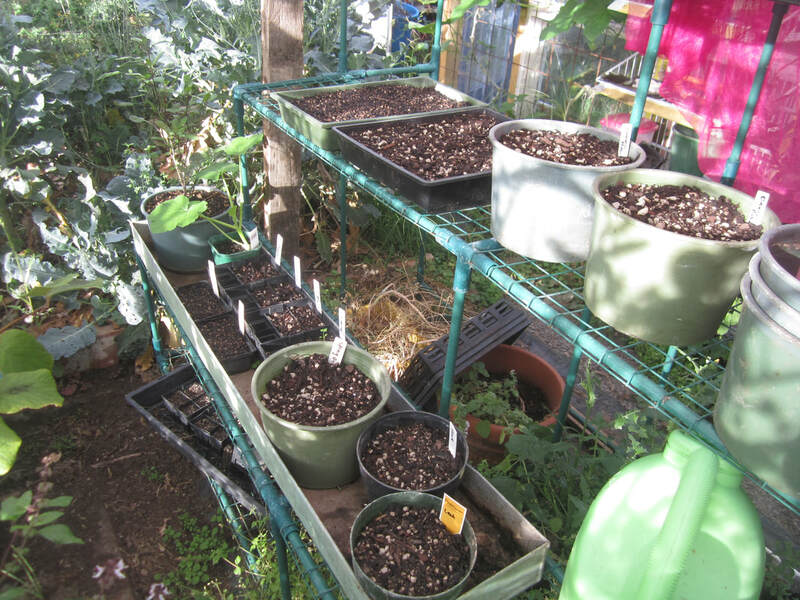 I've sown some seeds in the greenhouse - a few more plants of broccoli, cauil and cabbage, some celery, parsley, beetroot, leeks, red onions, brown onions, spring onions. I've sown the onions and leeks quite thickly in deep round pots - that way their roots can get quite long, and I should have lots of seedlings to separate out and plant. Soon I will sow peas and leaf lettuces. 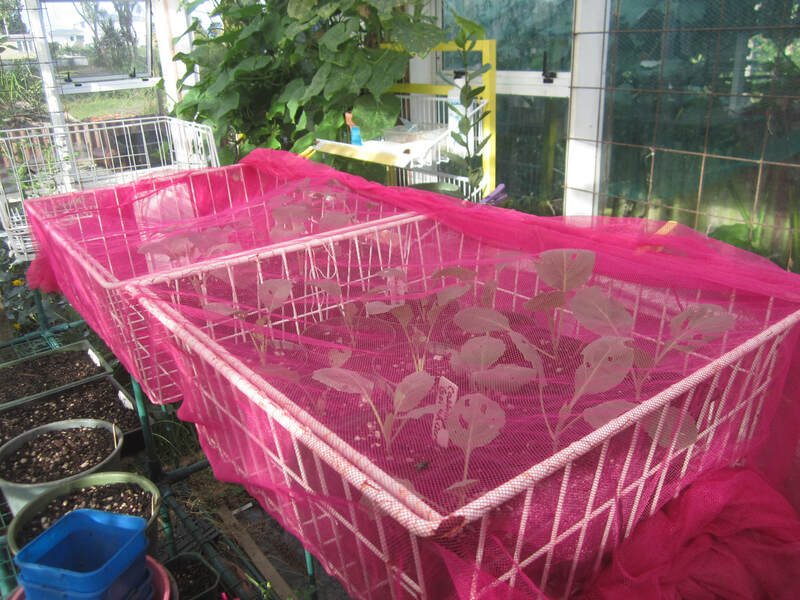 I also potted up the seedlings of broccoli, cauli and cabbage which I sowed a while back, and have put them under nets to keep off the white buttefly - I was slow doing this, so had to pick of all the caterpillars and eggs already on them first. These should be planted outside in about 4 weeks time. I best get some ground prepped for them! Meanwhile, I'm quite surprised that in spite of not buying any since before Christmas, I have not yet run out of: laundry powder, toothpaste, shampoo, conditioner, moisturisers, deodorant, autodishwasher tablets, dishwashing liquid (almost - still have some left, but have now made one batch of my own, and just bought a bottle of another to try this week), cleaners, ziplock bags, bin liners, gladwrap, baking paper, or foil. I honestly thought a lof of these would have run out sooner, forcing me to experiment. 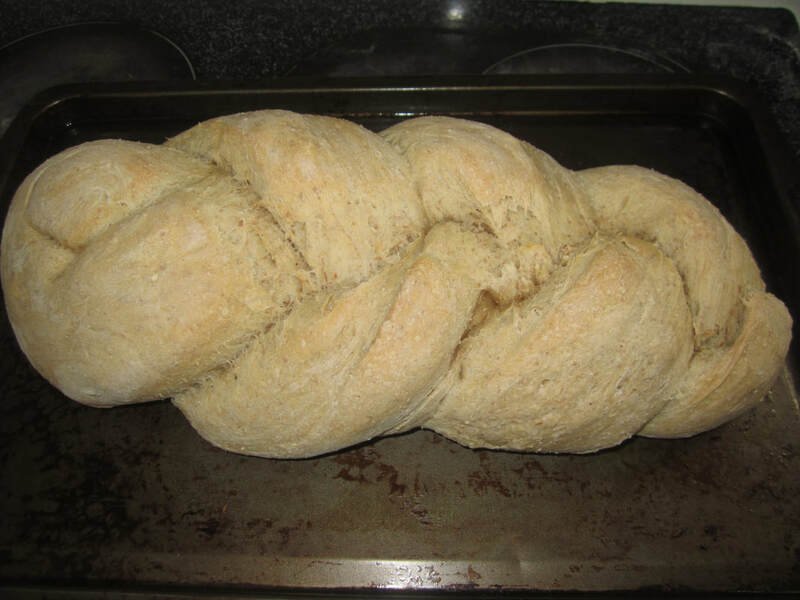 Oh well - I still plan to experiment with home made versions of many of these in due course, and will post successful recipes or alternatives. Now, it's good to have stock of frequently used items on hand and purchase when on a good special, but this has been an eye-opener on just how much less of all these things we use these days, since the kids left home (remember, I'm still adjusting from having gone from a family of 7-8 (with boarder) to only 2 in quite a short space of time). I have succeeded in working my way through most of my frozen stock of bananas, tomatoes (turned into bottled products), a lot of bones now made into stock, and some of the meat etc. With a bit of sorting, I can probably compact most of what's left in one freezer into my other one. Which is good - as the butcher is coming soon; we need to reduce our sheep numbers, and I'll need some room for frozen meat. 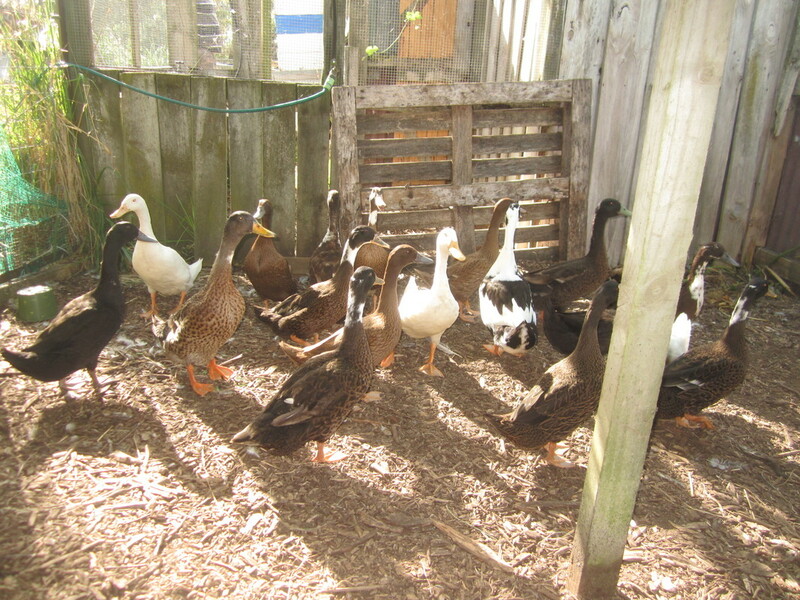 We've got some more ducks and a couple of roosters we need to process too. 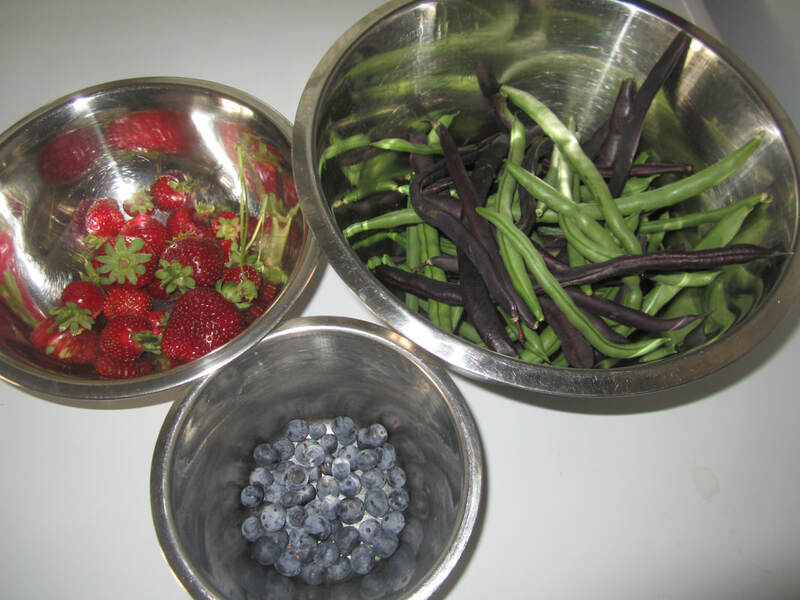 Going forward, I intend to continue to focus our meals around what is available in the garden. 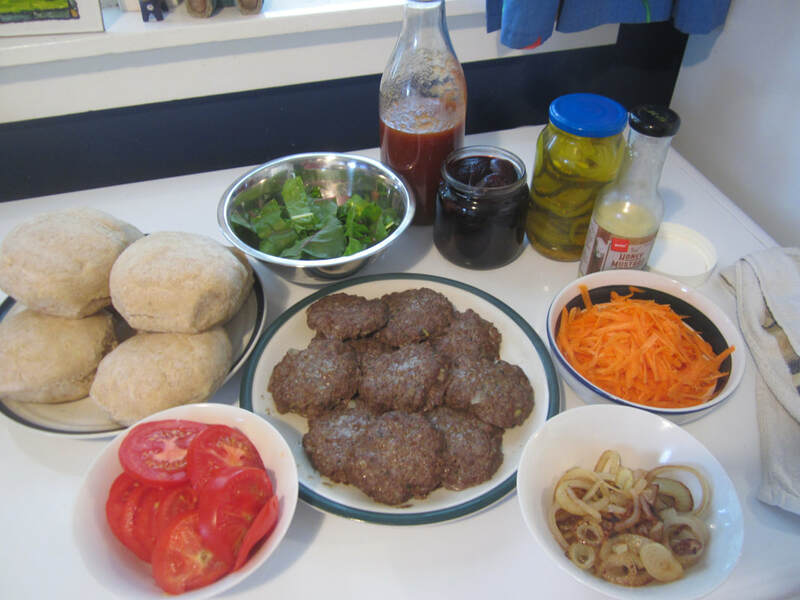 I'd really like to get to where we only need to buy a very few food items, and can live almost entirely out of the garden/homestead. That isn't just about money, but about eating fresh, healthy, wholesome foods. The main downside of this little challenge has been that I've done baking I normally wouldn't. Which meant I ate it too. Which meant I put on a few kilos. Sigh. Time to reverse that! On the plus side, I have shown myself that I can spend a lot less than I have been, and still eat well. 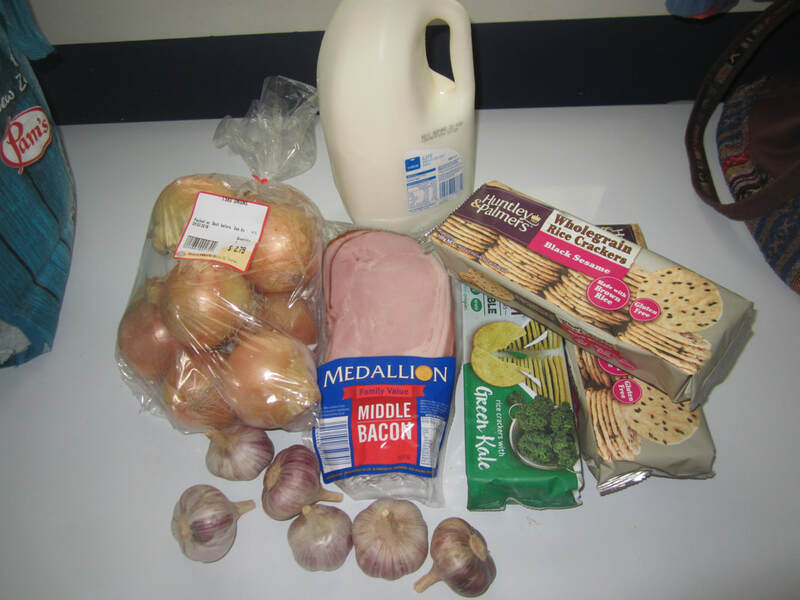 I need to go back to regular meal planning, and planning my shopping more closely, buying only what we really need. This spend next to nothing challenge has been great for recalibrating my shopping and spending! 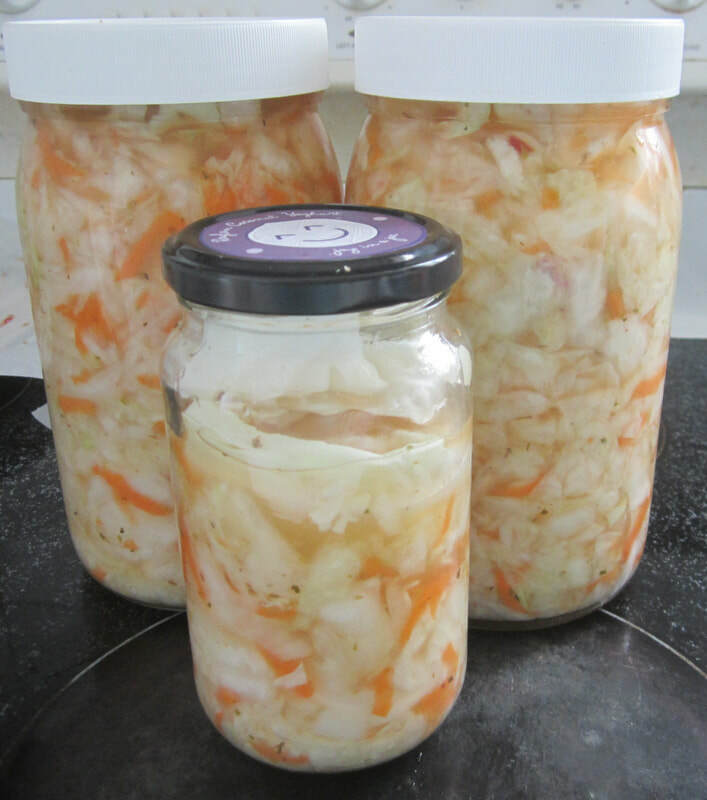 This week has been mostly about just keeping the food rolling - doing some preserving, using what's already in the fridge, and cooking meals as they come. 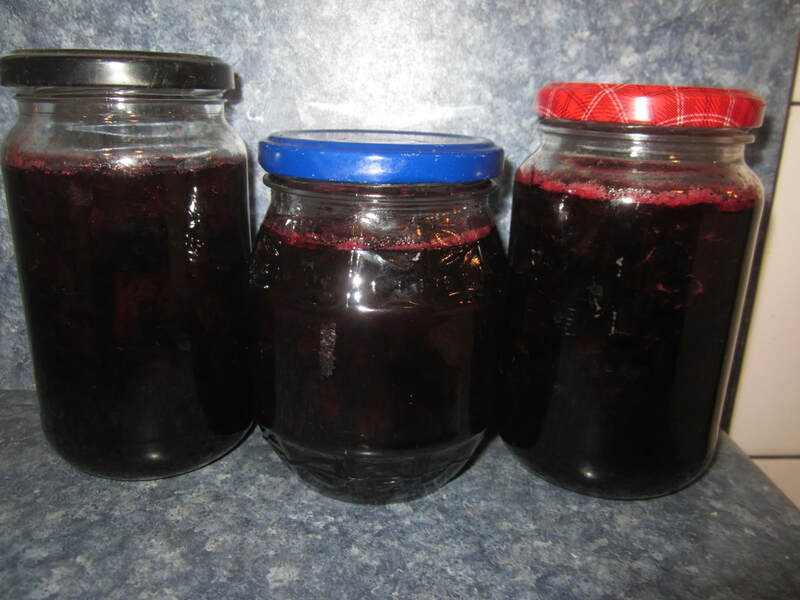 I made a small batch of plum jam with plums from our tree - this is an "off year" - plums tend to crop heavily one year and rest on the alternative year - so there is a smaller amount. 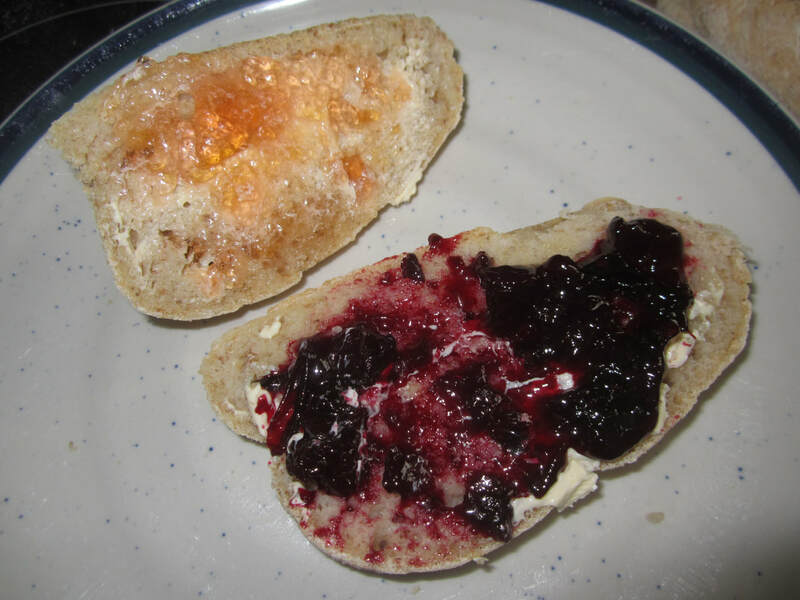 I've enjoyed eating them fresh, but now the rest needed using up, so I decided to make jam. Such a rich purple colour! I used up the last of last year's butternut squash this week. Such a rich colour and sweet flavour! 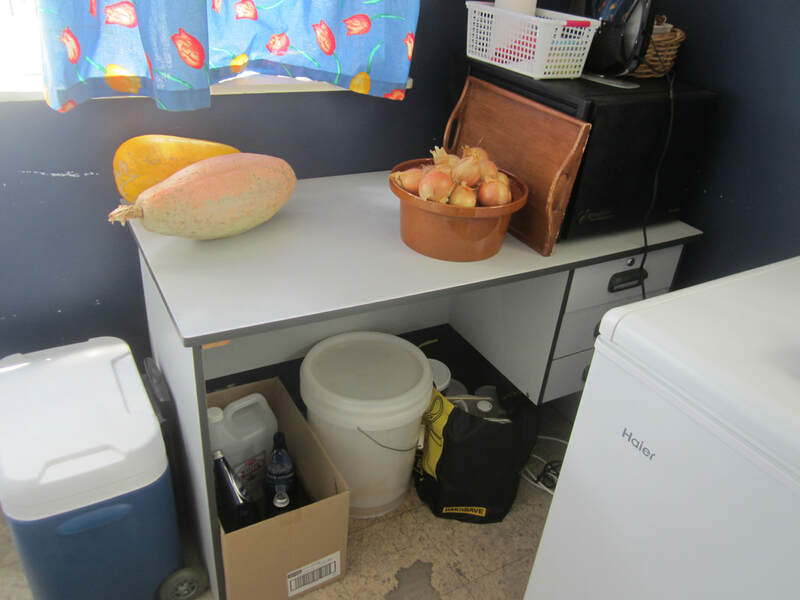 Like most squash, butternut store well if harvested at the right time and properly cured and stored. 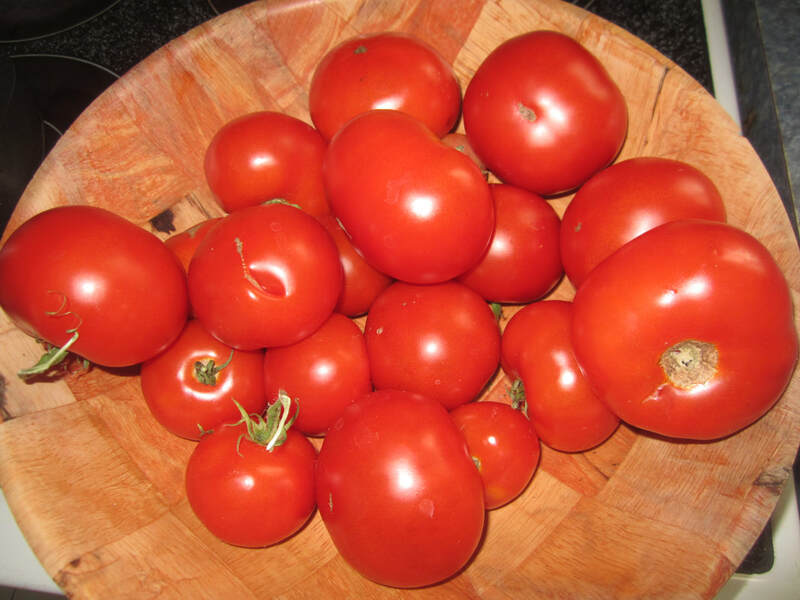 They taste best if stored for a couple of months before eating - they are a bit bland when newly harvested, but get sweeter over time. 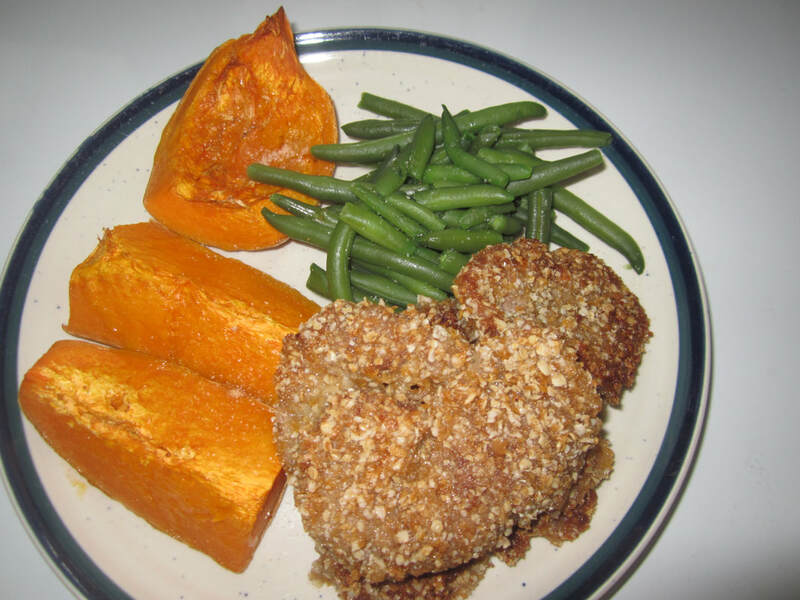 In this meal, I baked the squash, and served it with green beans and venison schnitzel crumbed with a mix of cornflakes, ricies and rolled oats blitzed in the food processor. 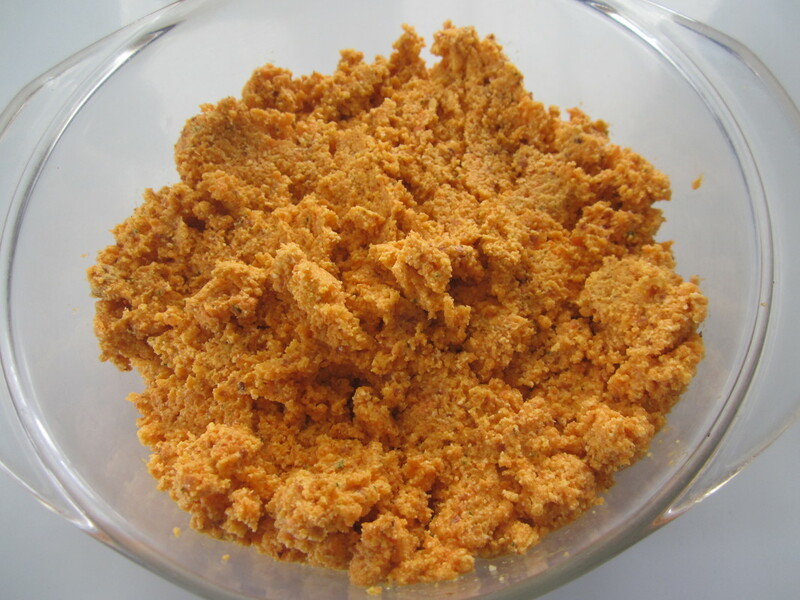 Meat is first dipped in rice flour, then egg substitute (or egg), then crumbs, before frying. 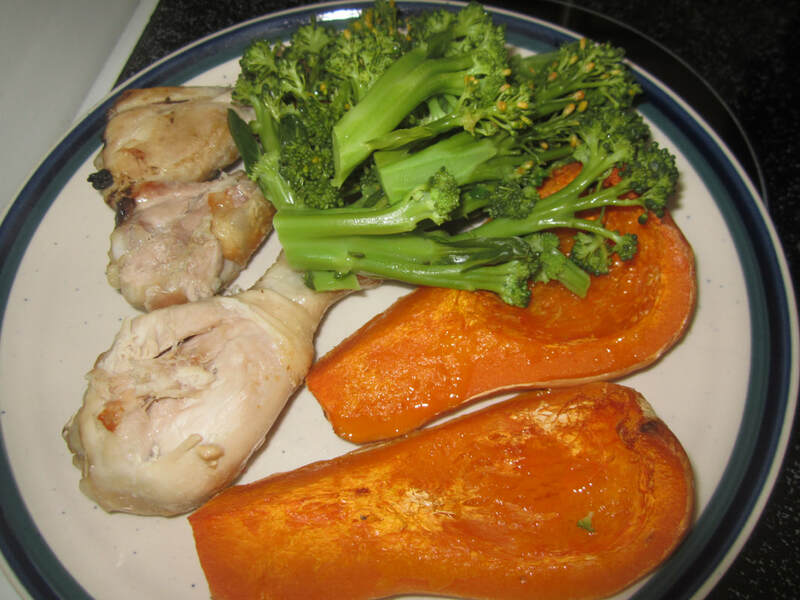 Another night I baked chicken drumsticks together with the squash, and lightly steamed some broccoli fresh from the garden. 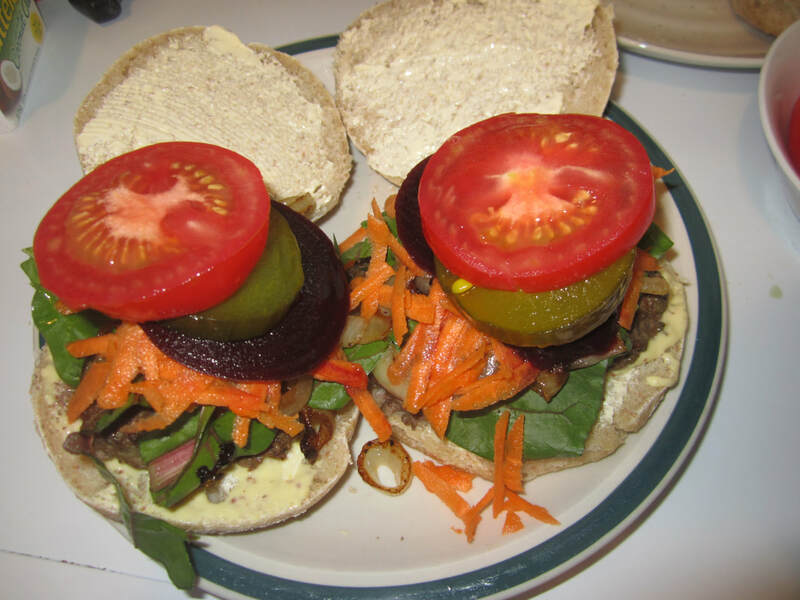 Simple, tasty and nourishing! 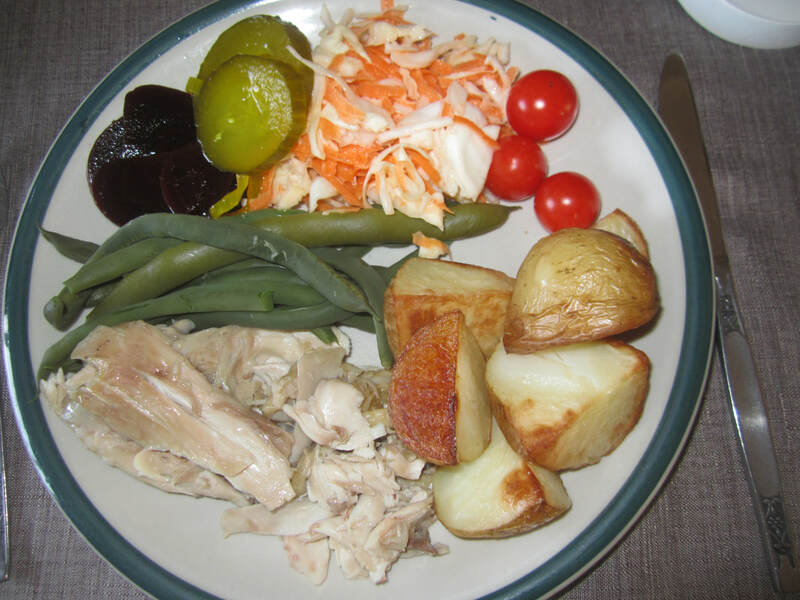 Here's my dinner another night - I had roasted a very small chicken in the oven, along with some potatoes straight out of the garden. I reheated some left over squash beside them, and tossed in some garlic straight out of the garden, and served with lightly cooked stringless runner beans and fresh Tumbling Tom tomatoes (both picked right before dinner), as well as some Curdito. Oh the flavours! Mmmm! 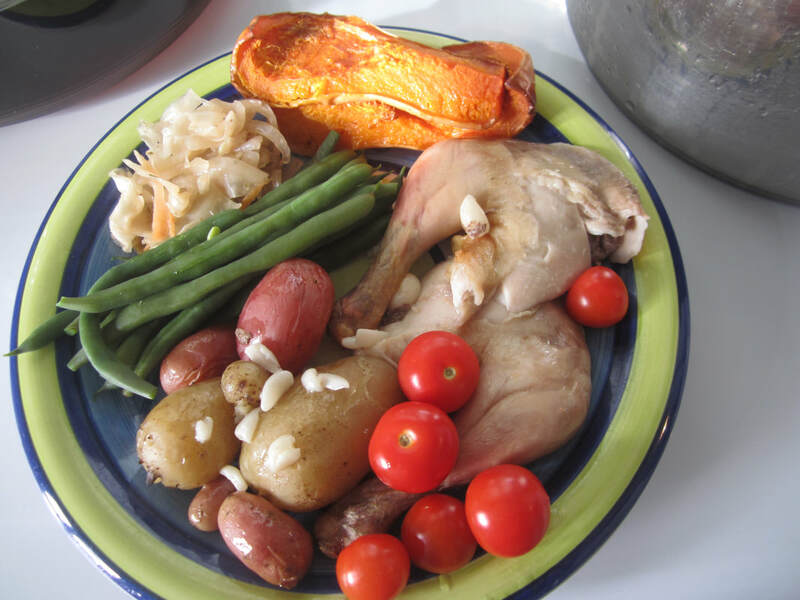 ​The rest of the chicken got served up cold in other meals with various goodies from the garden. The storm that blew through NZ this week didn't do any major damage here, fortunately. 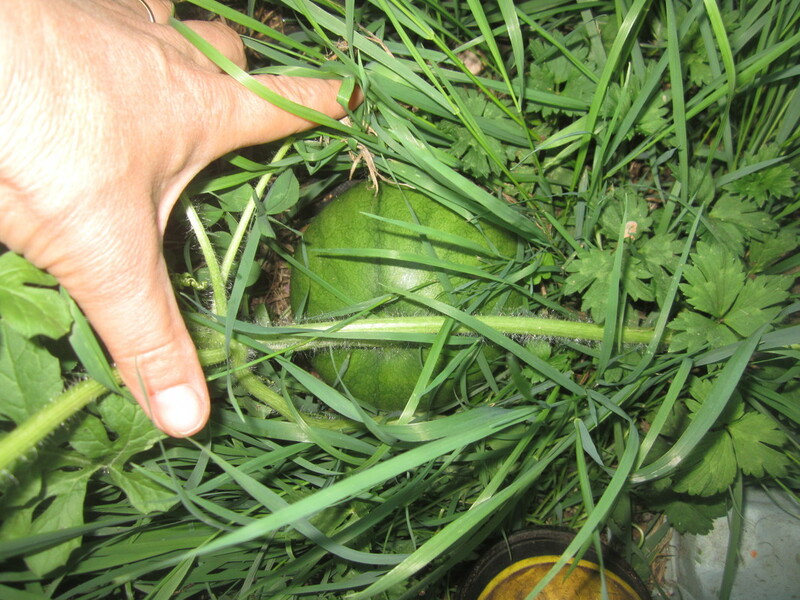 It did, however, part the leaves of my pumpkin/squash patch and give me a glimpse of treasures to come! The squash in the pic to the right is a Pink Banana Jumbo Squash; I grow them most years as they have a beautiful, sweet flesh - about the nicest squash I've ever tasted. Though in theory they can grow up to 20kg, I've never had them get bigger than 3-4 kg each. This one is waaay bigger and still growing! I'd estimate it at around 8kg or more already! And I can see a several others like it in the patch, as well as lots of (currently) smaller ones. Excited to see just how big any of them get! Though one does wonder...if you cut up a 15kg+ squash to use some for tea....how does one fit the rest of it in the fridge?? ;-) A nice problem to have - I'll have to share them out, and roast up extra to freeze for soups etc. 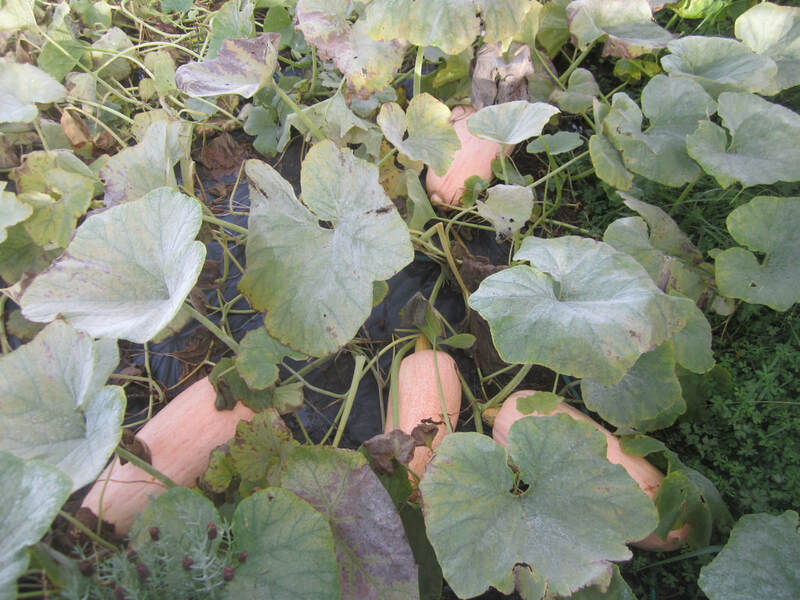 The squash will turn pink as it matures. Tuesday was duck dispatch day - we killed and processed 14 for the freezer. More to do in a few weeks when the younger ones have grown a bit more. These ducks reach adult size in 7 weeks! I don't enjoy butchering, but I appreciate the good meat from animals that have had a good life, free ranging in the paddocks, playing in their ponds, and enjoying the sun, shade, bugs and food. 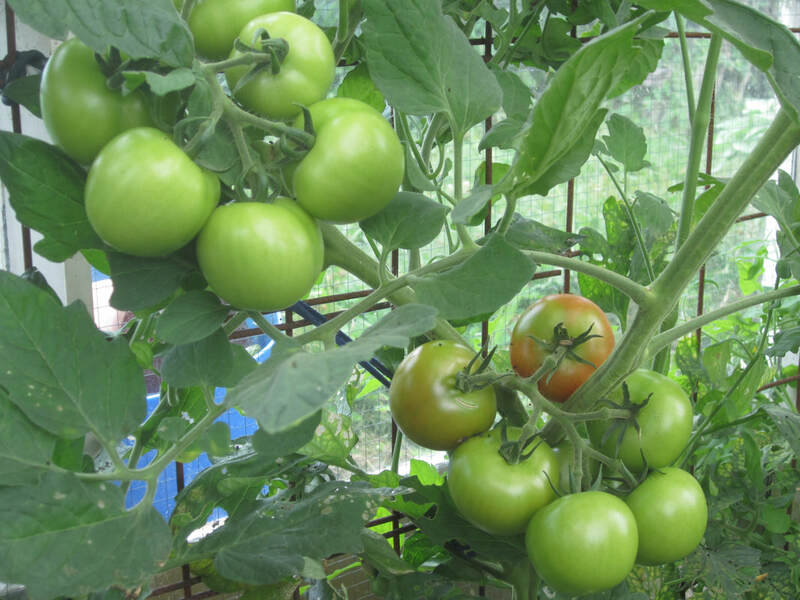 Moneymaker tomatoes are doing well in the greenhouse, as are the cinnamon and green basils growing below it. There is another Moneymaker on the other side of the greenhouse that isn't doing so well - perhaps because it's in a space where brassicas were (I added compost and food before planting). I wonder if toms and brassicas have a companion issue? Of course, they are both heavy feeders and one would not normally follow them after each other in the same patch for that reason. 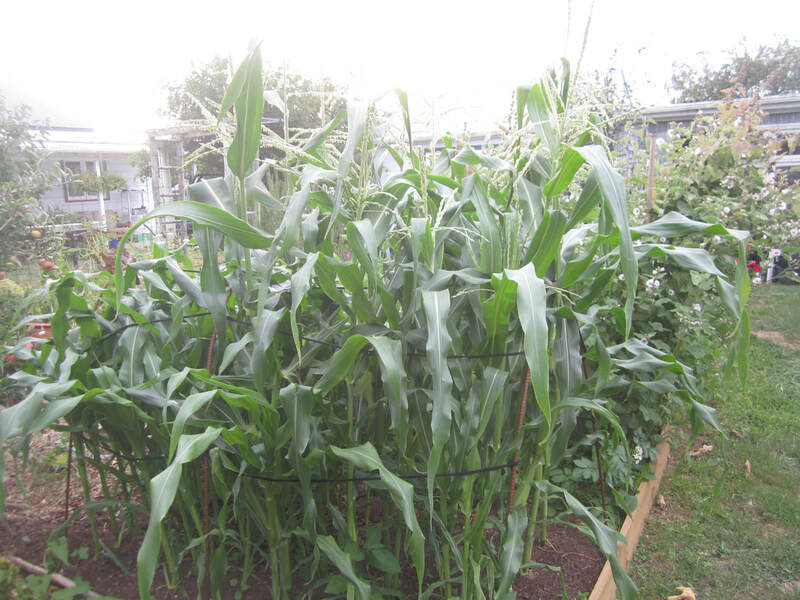 ​The sweetcorn patch is looking good - there are two heights because I planted half with seedlings and half with seed on the same day. Can't wait for fresh sweetcorn! Though it will be a few weeks away yet. Lemon Bergamot - first time I've successfully grown it, and it's looking stunning! Smells delicately of lemon, and the bees are loving it. 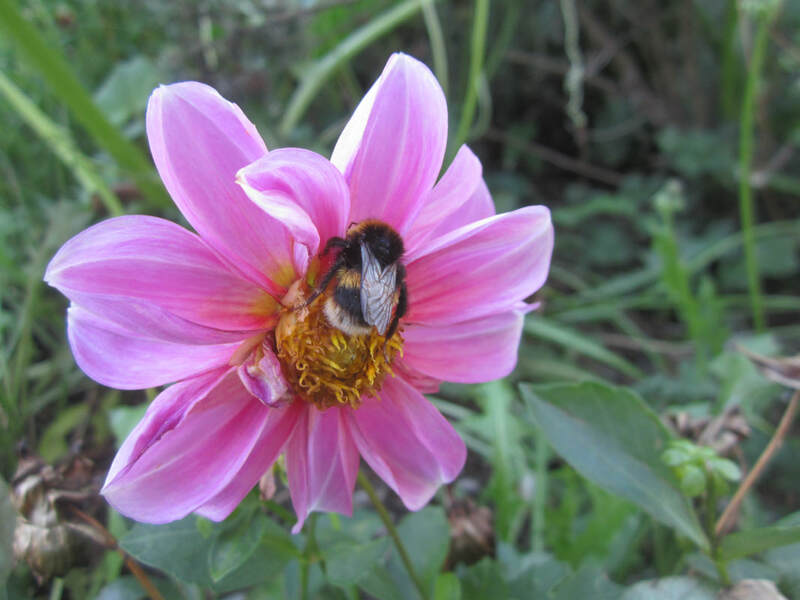 I had a pic of a wool carder bee on a flower in last week's post, but thought I'd show you the wider angle this week - this is two plants. I had no idea they'd get so big! I grew them from seed someone gave me. I started to clear out the carrot patch now I've collected as many seed heads as I want, and rough weed the area. I pulled out several bunches of mostly tiny spring onions I had planted around the patch (nearly a year ago!) that never really grew very big. 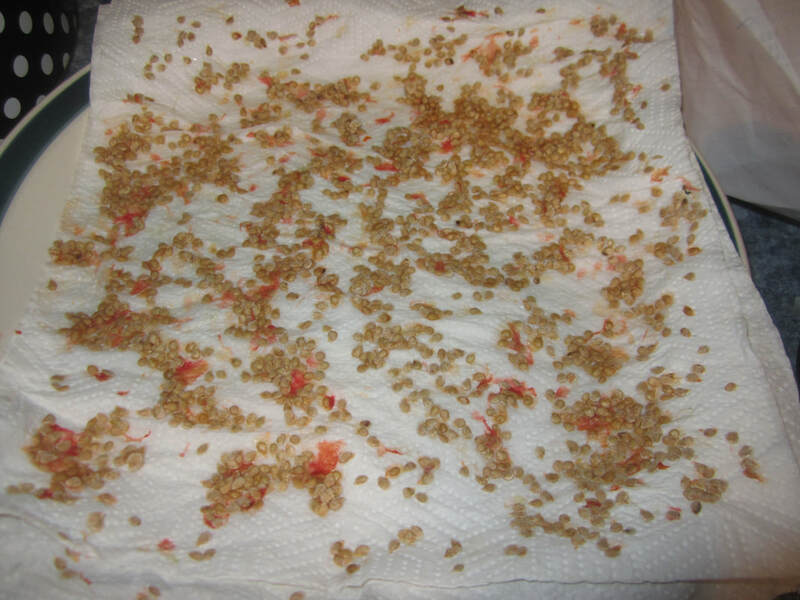 I tidied them up and chopped them and bagged them before putting in the freezer. 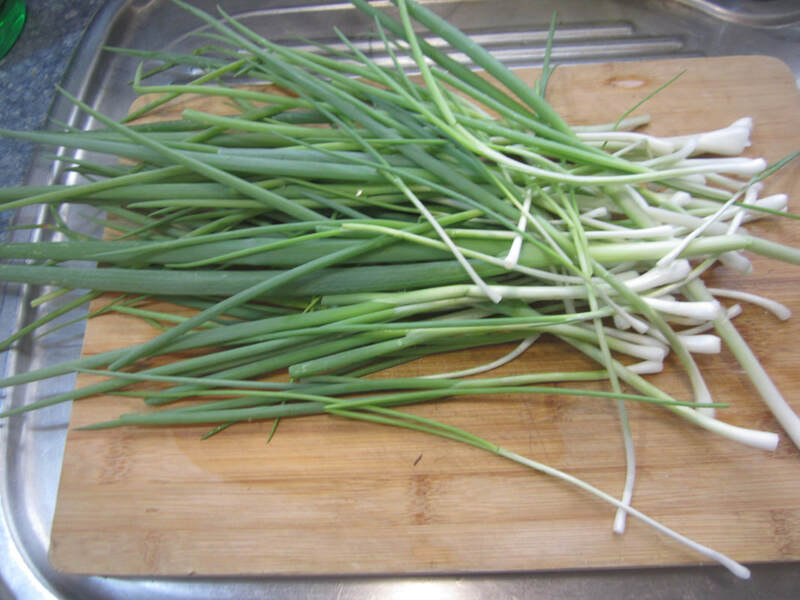 Handsful of spring onions are handy to add to a lot of dishes! I've decided that rather than finish clearing that part of the garden, I'm going to put the chickens to work. Which means first putting up a temporary fence and building them a suitable shelter. The other plus will be that while they are out of their current henhouse and run, I can renovate the ancient henhouse which seriously needs it! I normally have no trouble at all growing zucchini, so this year was more restrained than normal in my planting - putting in one plant then adding two more later. Wouldn't you know it - they've got the worst case of aphids I've ever seen! Normally I'd just remove plants like that - bad aphid infestations are normally indication of a stressed, unhealthy plant. But I really want more zucchini! 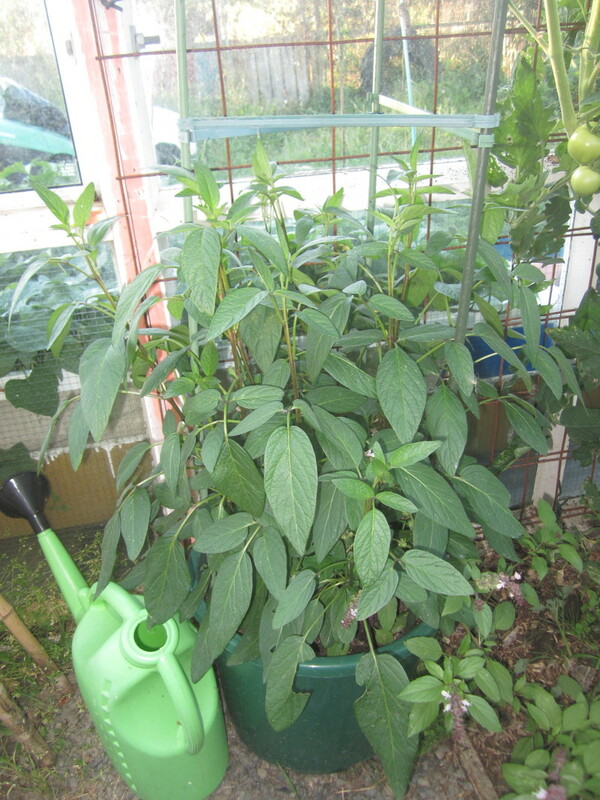 So I've removed the worst leaves and sprayed the plants with a solution of silverbeet liquid with some added dishsoap, just to see if it works. ​I've also planted some more seeds in the greenhouse - will raise a plant in there to keep me going as long as possible before it's too cold. 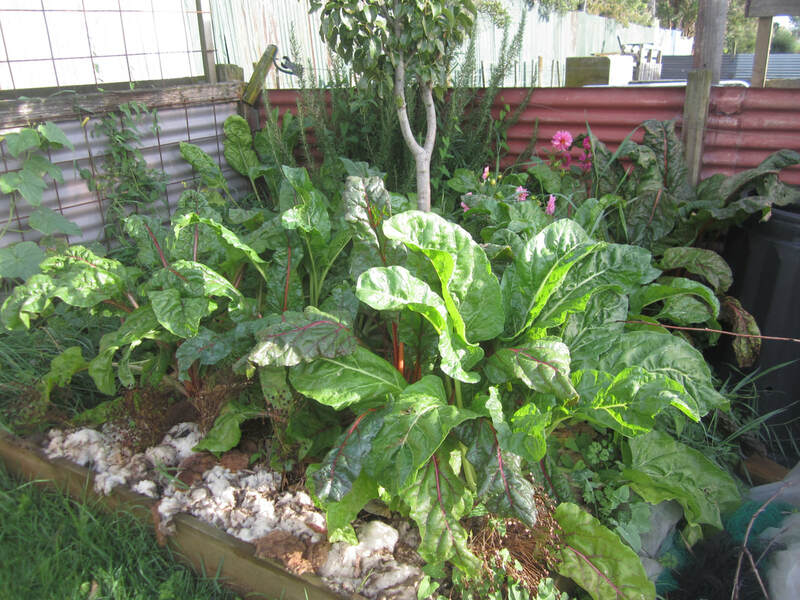 The kumara I'm growing in two bathtubs this year are looking pretty good! Leaves are edible - must get around to steaming some for dinner one night. This is a pepino. 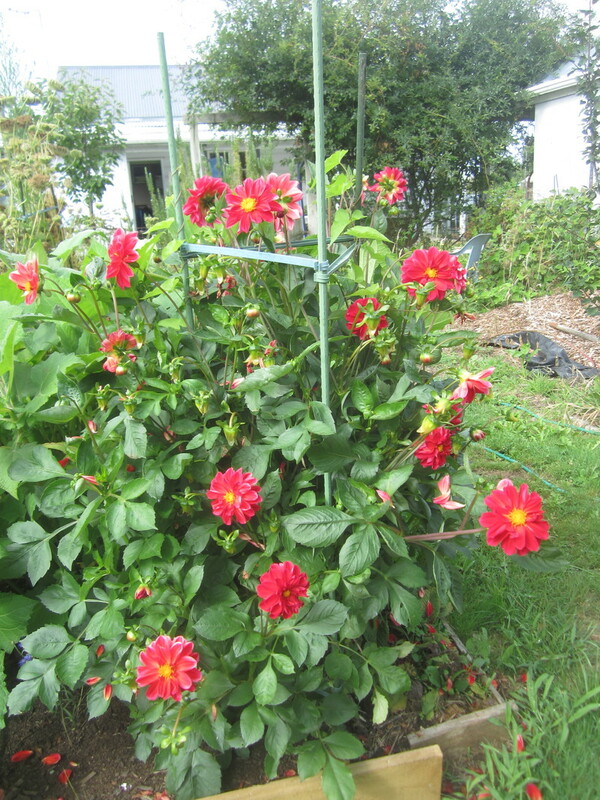 A friend in Auckland sent me seeds 3 years ago...I had a plant which I kept going for two seasons, wintering in the greenhouse. 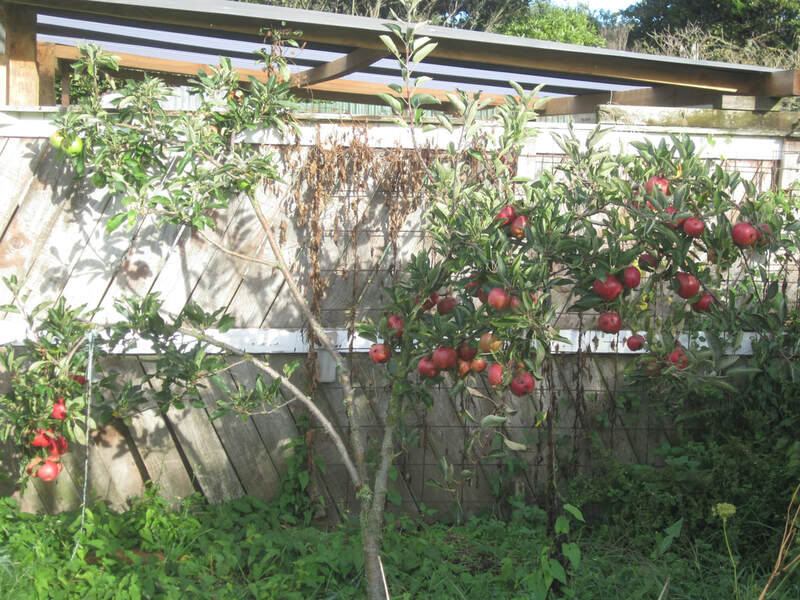 Last year it had lots of lucious fruit, but then became pretty manky looking. So I took a cutting off some healthy stems, rooted them in water, and nurtured a couple of new plants through last winter. I potted one up in this pot, fed it some manure tea, and off it went! There are a couple of fruit on it already - with many more to come hopefully! 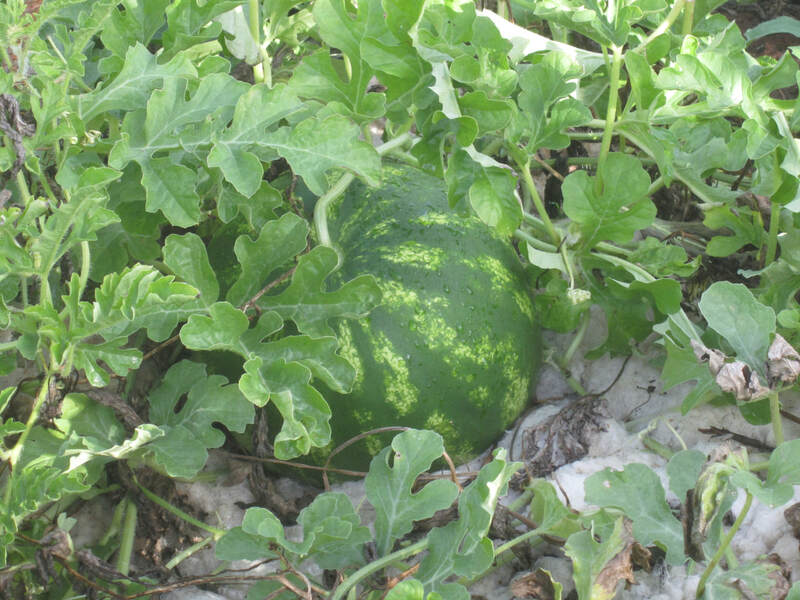 Look, a baby watermelon! 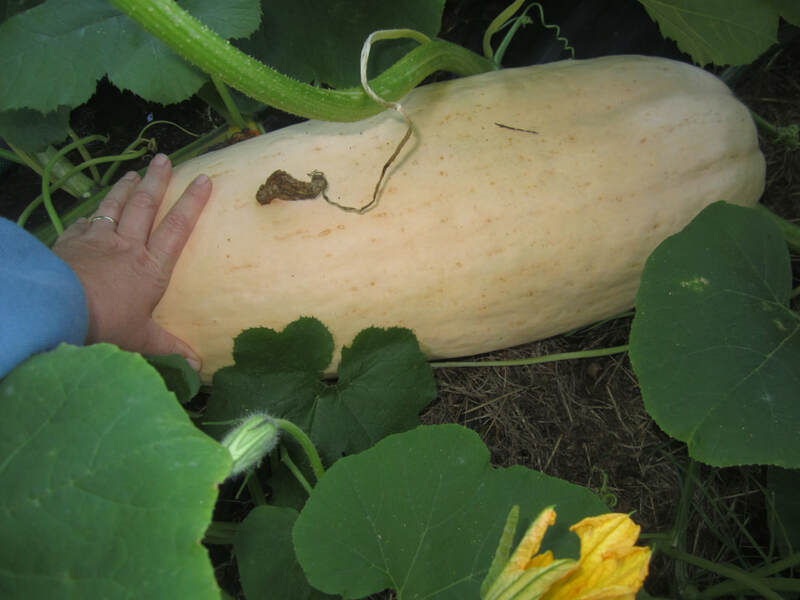 :-) They grow very fast from this point - looking forward to sweet juicy watermelon next month! 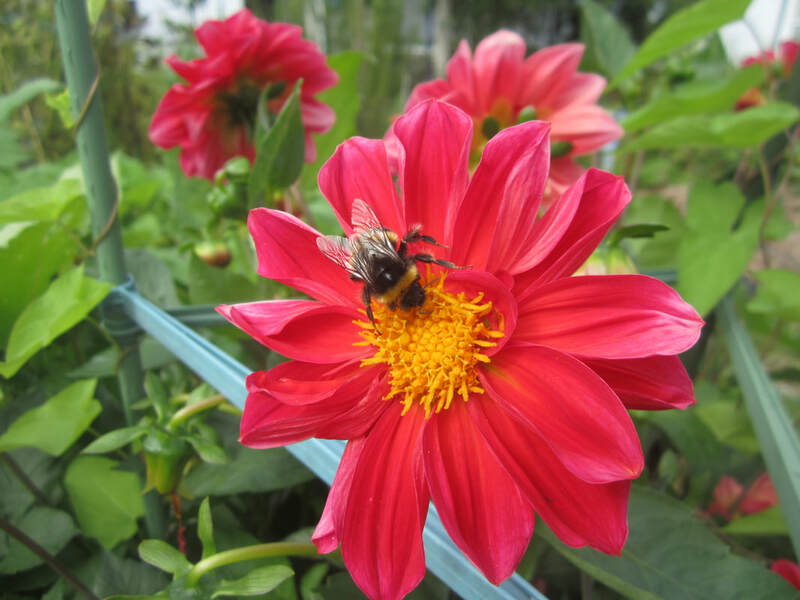 Did you know that Dahlias are super easy to grow from seed, perennial, and the tubers are edible? And of course, bees love them! 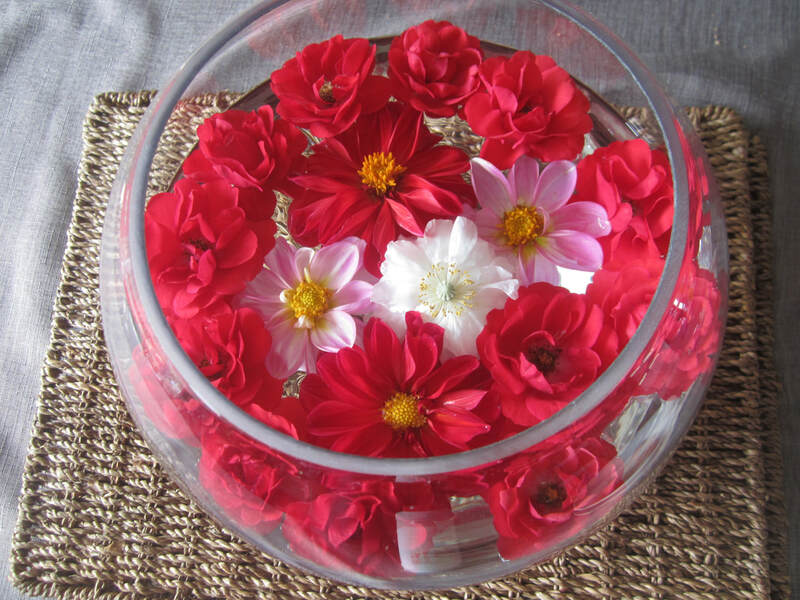 So many pretty colours to choose from too - and different sizes and forms. Reputedly, some taste better than others, so if you want to try eating them, some experimenting may be required! 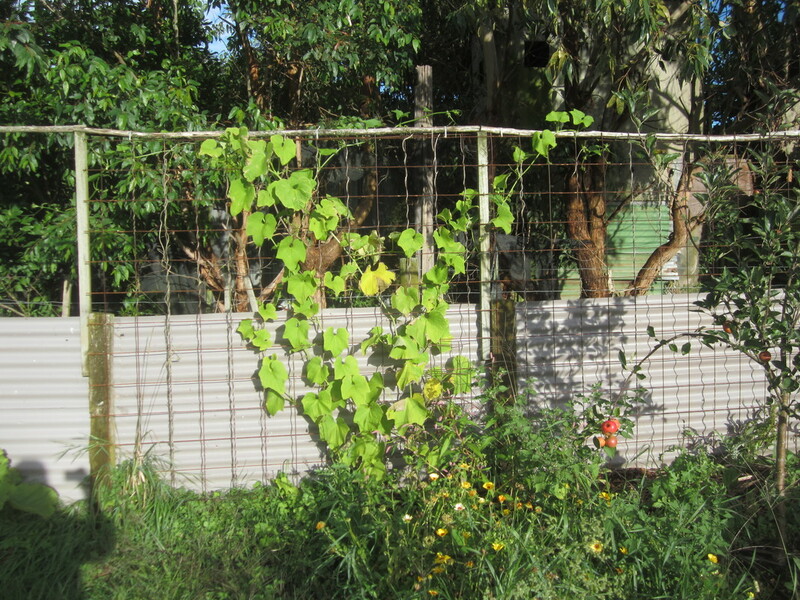 Have given the grapevine a long overdue summer prune. there are grapes galore! 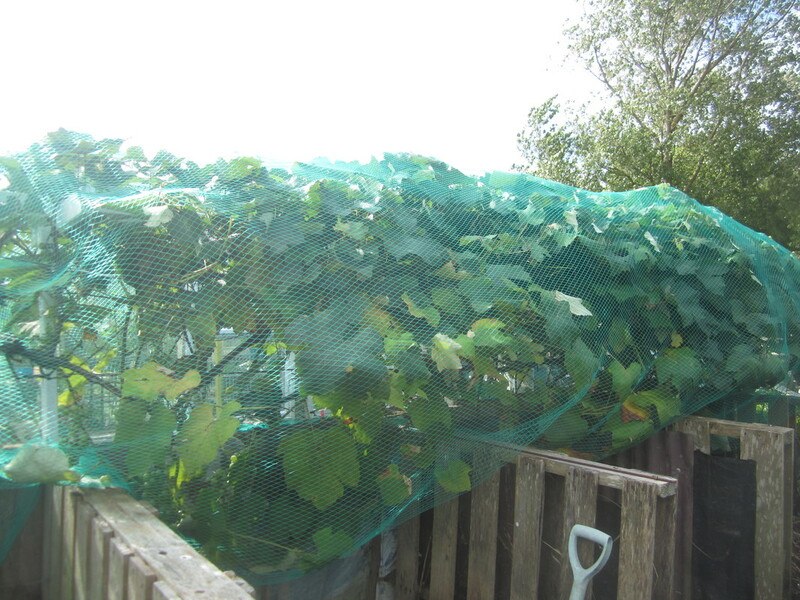 MUST get the nets up tomorrow, now the birds can see them, before they become ripe, which won't be far away. All I've purchased was 2 bottles of milk for my husband - $6.84. On Tuesday night, after spending the morning butchering and then still needing to put in a full day's work in the office, on little sleep the night before, I decided to heck with it - we're having takeaways for dinner! So we had fish and chips - $13. I could have avoided this, but I simply didn't want to. And very occassionally, that's ok.
Got a load of bloodstained clothes? 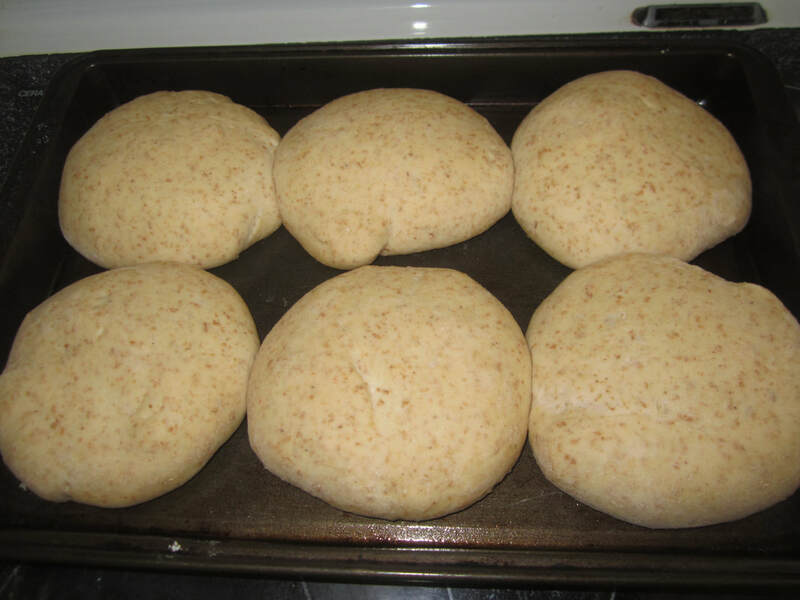 Chuck them in the washer with a cup full of baking soda, and put through a normal, cool cycle (no detergent). Pull out and spot treat any stains you can still see, or give them a rub with Wonder soap. Chuck back in the machine, add detergent, and put through normal cycle. Easy peasy, and very effective! 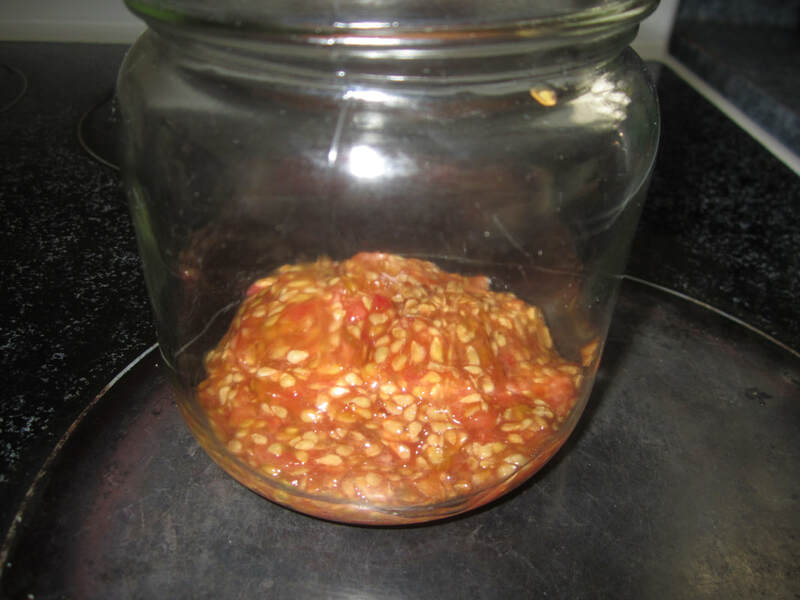 Don't thow out any glass jars or bottles, or their lids - they can all be washed, and reused for preserving! 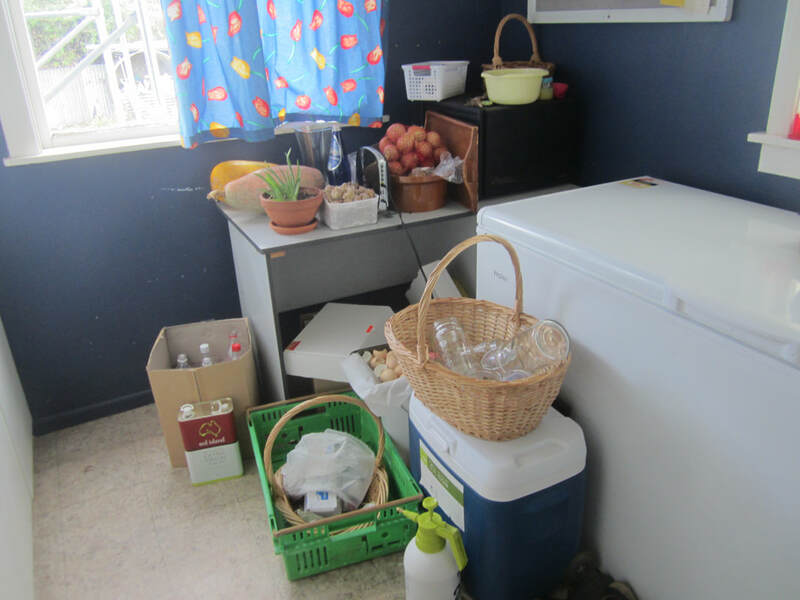 Jars and bottles are precious - ask your neighbours for theirs, check out op shops etc, and build up a collection. Buying brand new preserving jars is expensive. 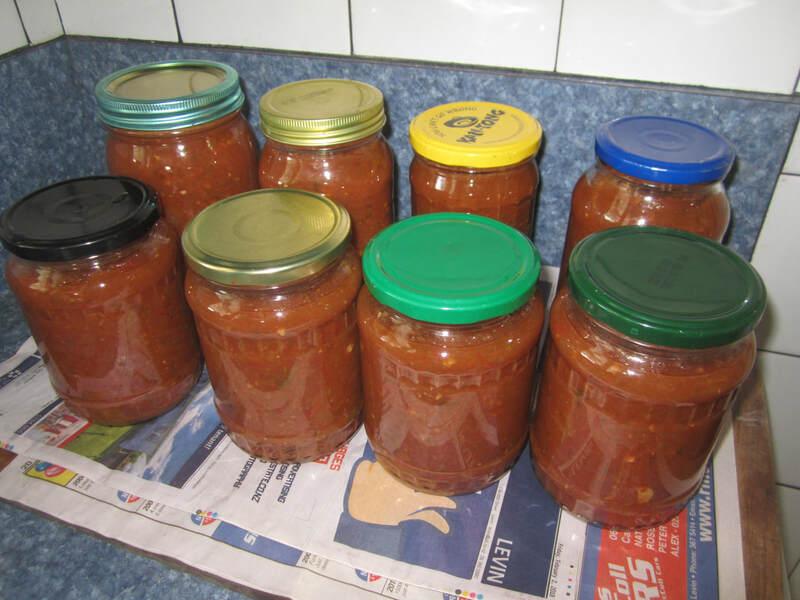 I built up a collection of second hand "proper" ones through garage sales etc, and the rest of mine are reused salad dressing, pickle, jam and cordial containers. 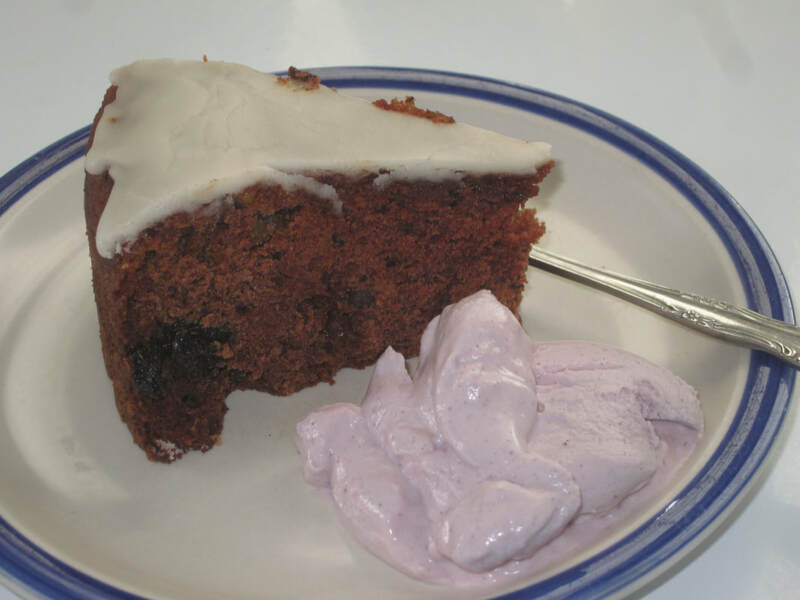 This week I carried out a number of successful experiments in the kitchen, as well as doing some old-favourite preserving etc. I bottled yet another batch of Pickled Cucumbers. ​Since my zucchini plant is now producing, I made up a batch of my favourite Garden Goodies Pasta Sauce - been so missing it since we ran out! I made up a batch of coconut milk, as well as some more almond milk. Both are easy-as and taste good! I especially like to combine them in cuppas or on porridge/cereal. For smoothies, I use straight coconut milk. 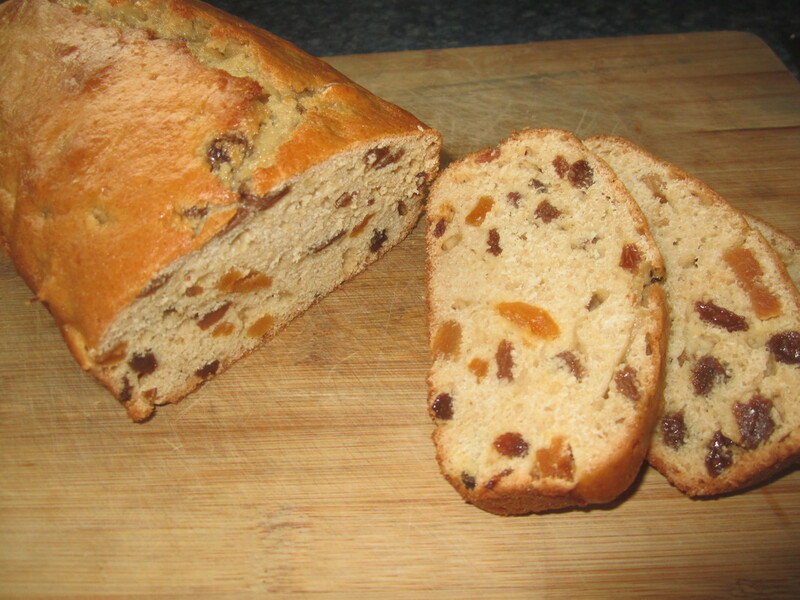 For baking I often use almond milk. 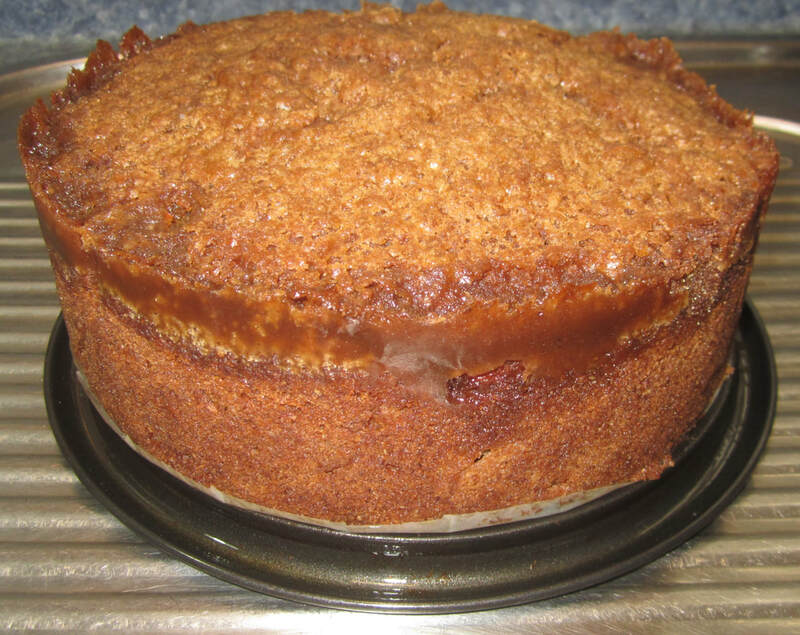 In the mood for some baking, I made an all natural batch of what I'm calling Fruity Drops, and converted an old friend's Apple Nut Cake recipe to gluten and dairy free. 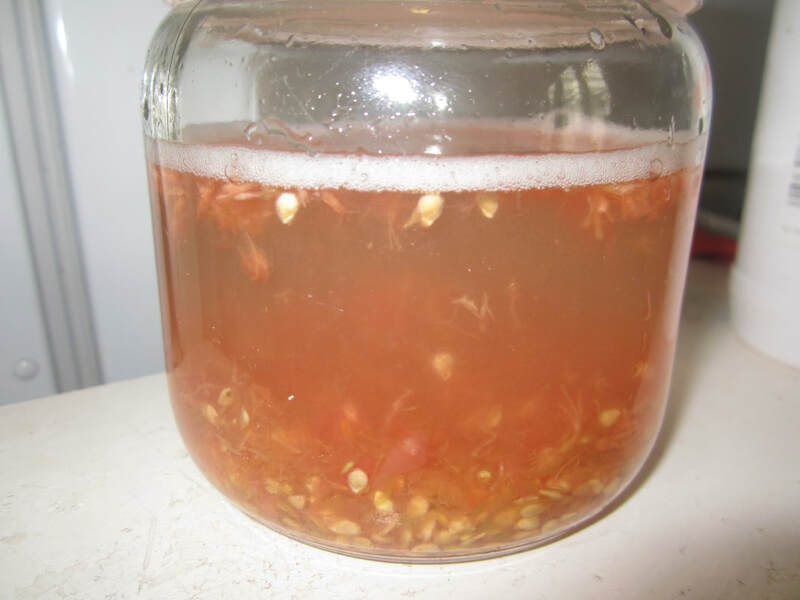 A friend dropped off some water kefir grains for me, so I've started a batch of water kefir - a fizzy, delicous, probiotic drink. More on that when my first successful batch is completed. At the same time, my first batch of (hopefully) new-and-improved green tea kombucha has moved from it's first ferment to the second ferment (bottled and kept at room temp for another week). Can't wait to try it next week! I turned some left-over cauliflower rice into a fried rice for tea one night - cooked a chicken breast and put aside, sauted some onion and veges in a little coconut oil, added salt, herbs and soy sauce. 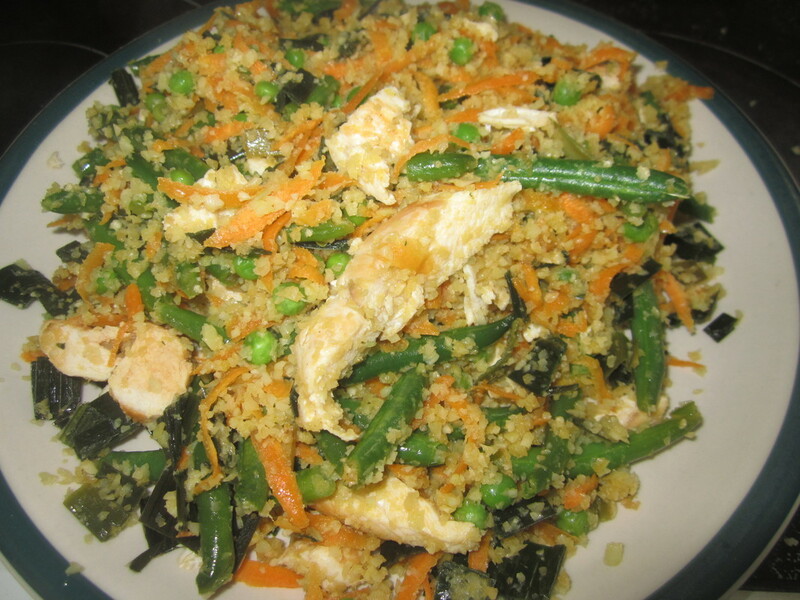 Tossed in the cauli rice and cooked, chopped chicken, and cooked for a few minutes - done. 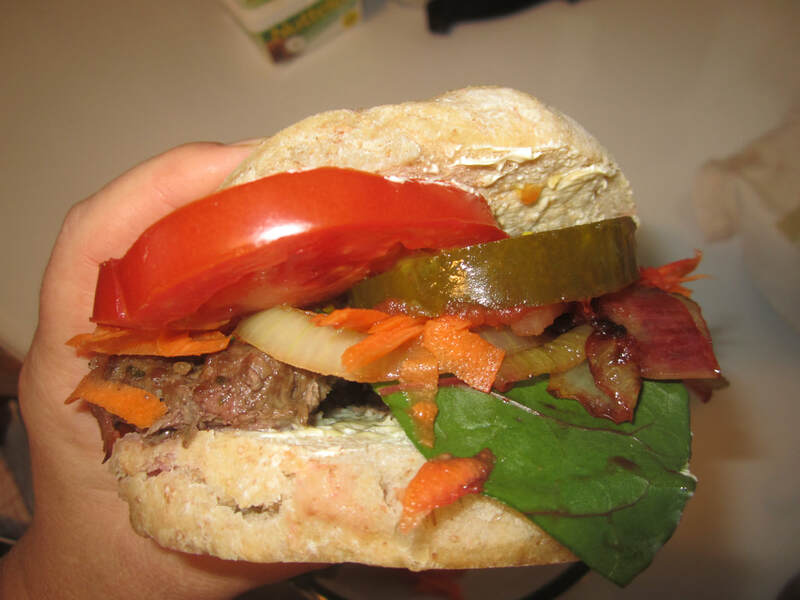 Was yum with a good dollop of the green tomato chutney I made a couple of years ago. 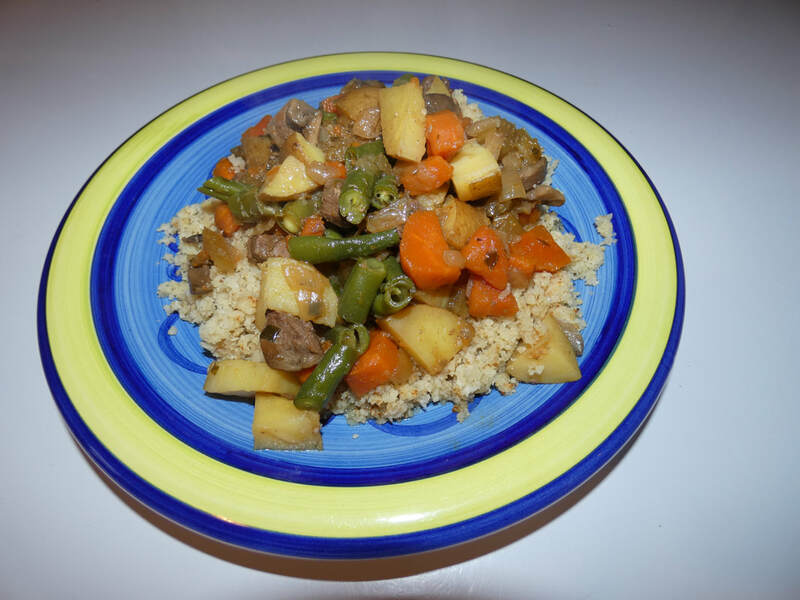 I also used cauli rice as a base for a tender, yummy stew, made with some gravy beef I'd bought on special some time back, then divided into suitable sized portions and frozen. 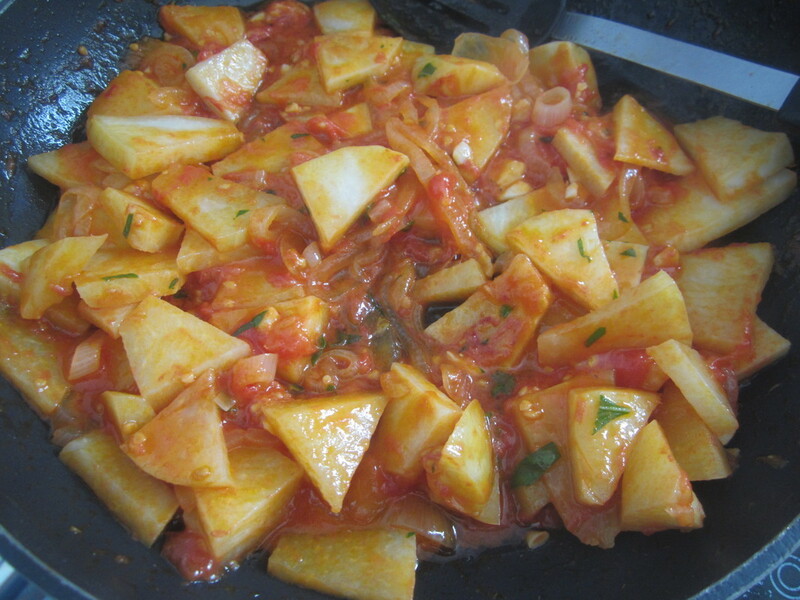 I cooked my first kohl rabi by peeling and thinly slicing it, then frying in coconut oil until tender. Yum! 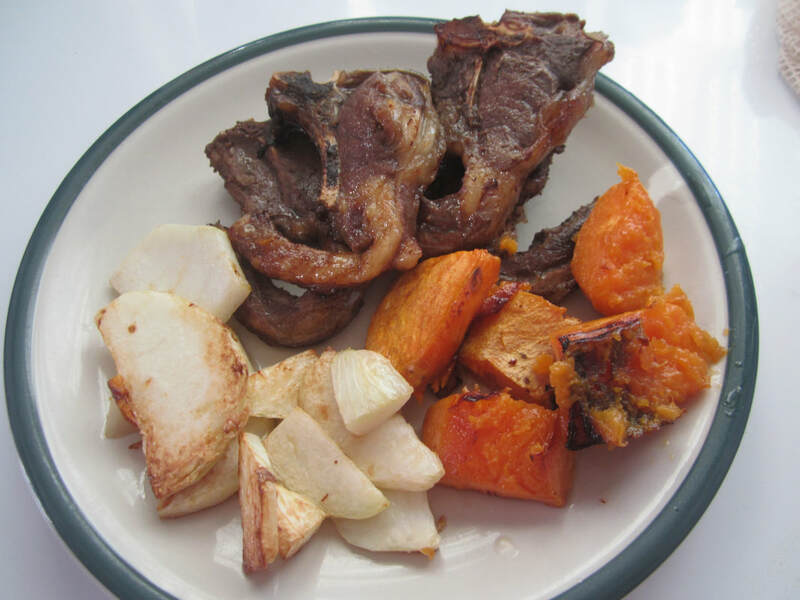 I served it with lamb chops and kumara baked together in the oven. 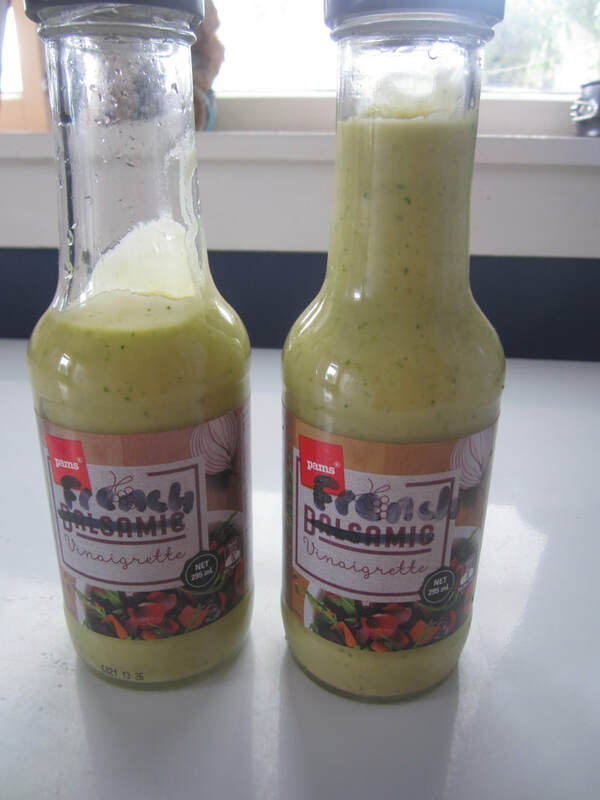 I made up a tasty French Vinegarette dressing using some raw apple cider vinegar in which I had steeped chive flowers for a couple of weeks, giving it a pretty pink colour and a delicious flavour. Recipe/instructions to come. 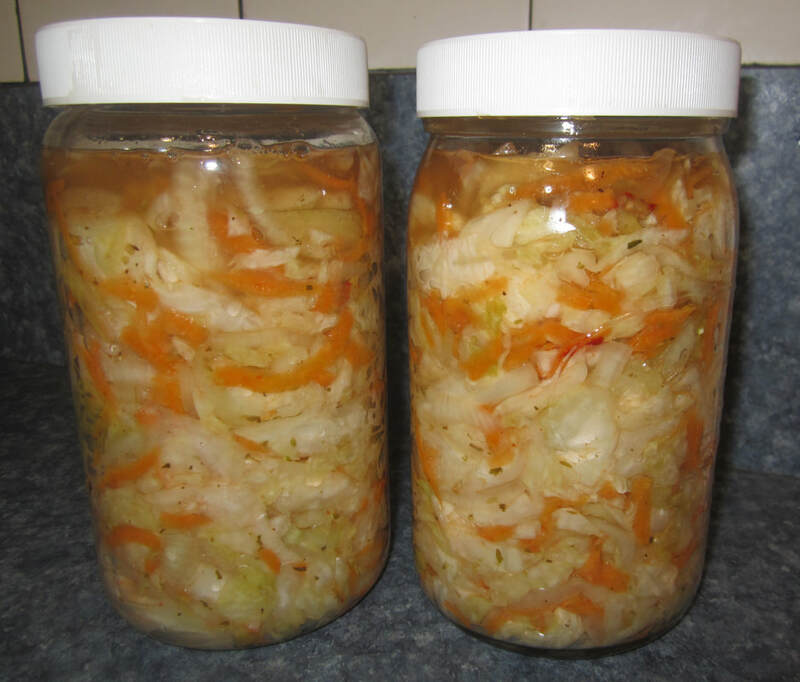 I also made a batch of Curdito - South American sauerkraut - which has cabbage, carrot and onions in it. 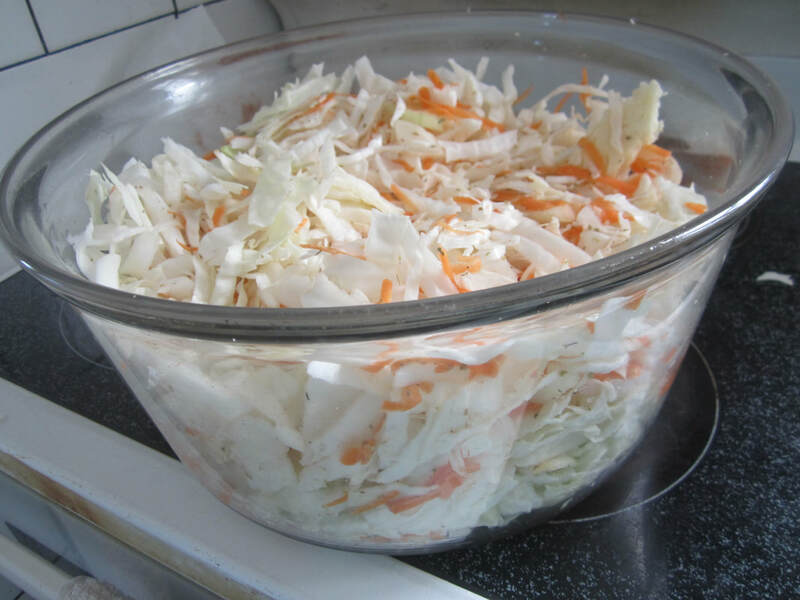 Making sauerkraut with homegrown cabbage is so simple and such a pleasure, because of the high-water content of the cabbages compared to bought ones. 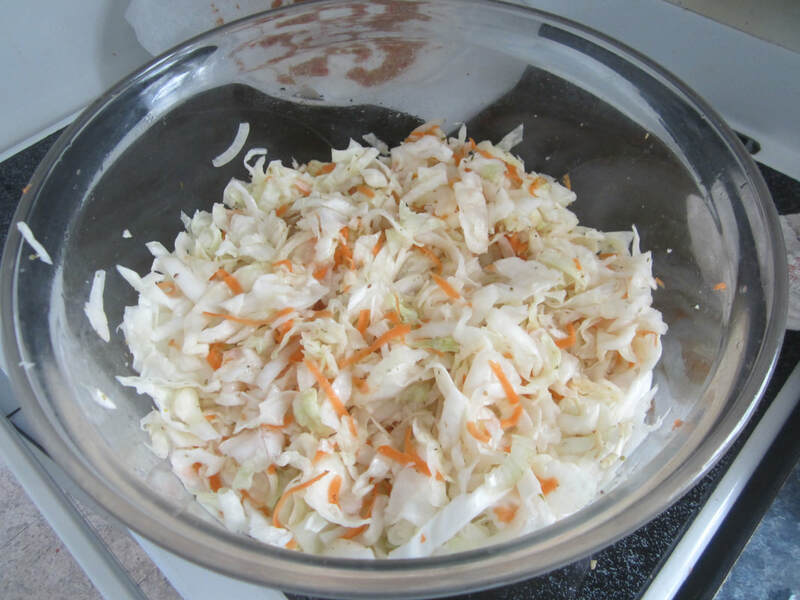 This sauerkraut is delicious! Recipe to come. 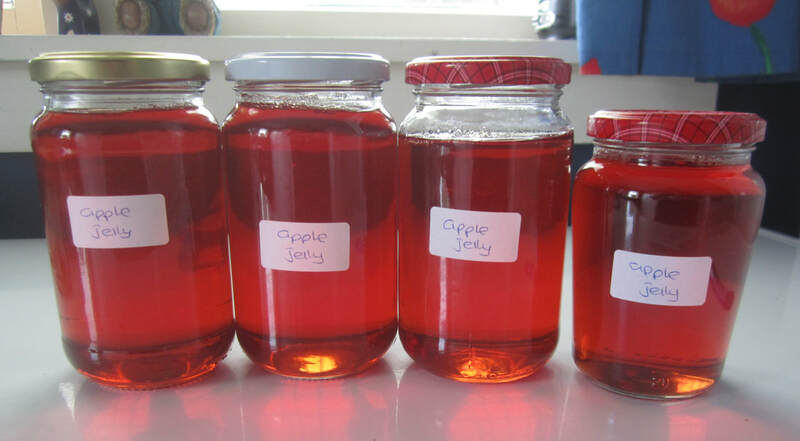 I cooked up more apple jelly with the liquid from the fallen, immature apples of our trees. This time I skimmed it properly as it cooked - doesn't it look pretty?! 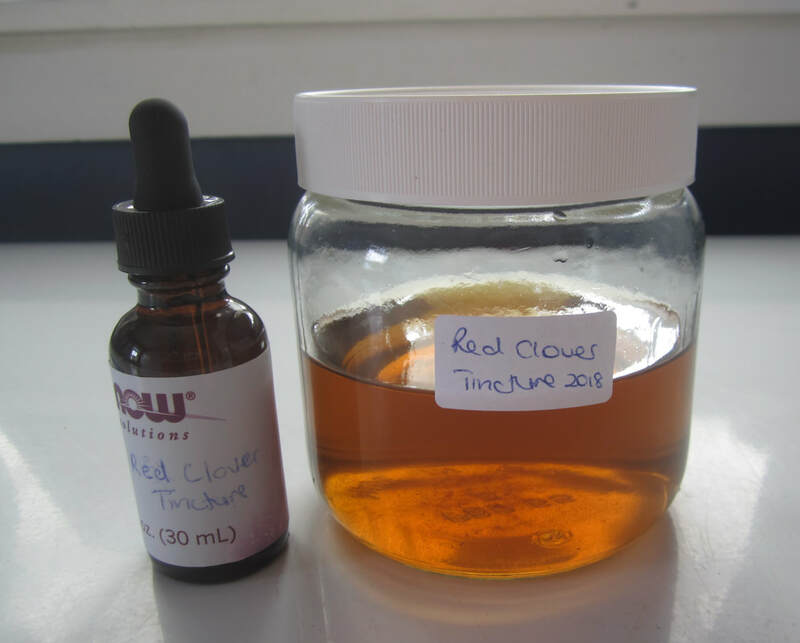 A while back, I had harvested red clover flowers and set them in a jar covered with vodka to create a tincture. 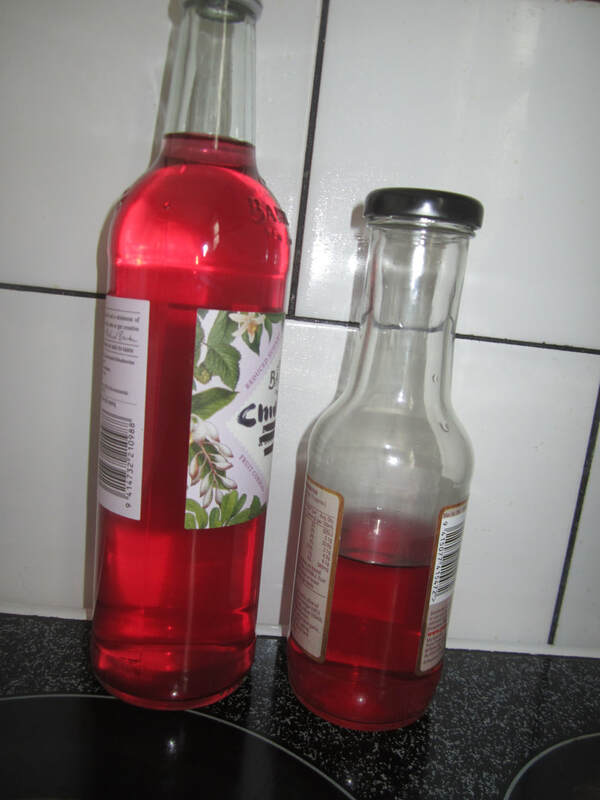 This week I strained them and put the tincture in a clean jar, pouring some of it into a dropper bottle for easy administration. Dropper bottles are available in 6 packs from iherb.com at a reasonable cost, and useful for many herbal remedies. More on this to come. Lunch one day: fresh NZ spinach, green cabbage and rainbow chard from the garden, Curdito (above), fresh tomatoes from the garden, my new dressing, and some pickled cucumbers. Such a visual feast, and such a wonderful explosion of various tastes and textures on the tongue, jam packed with freshness and nutrition. 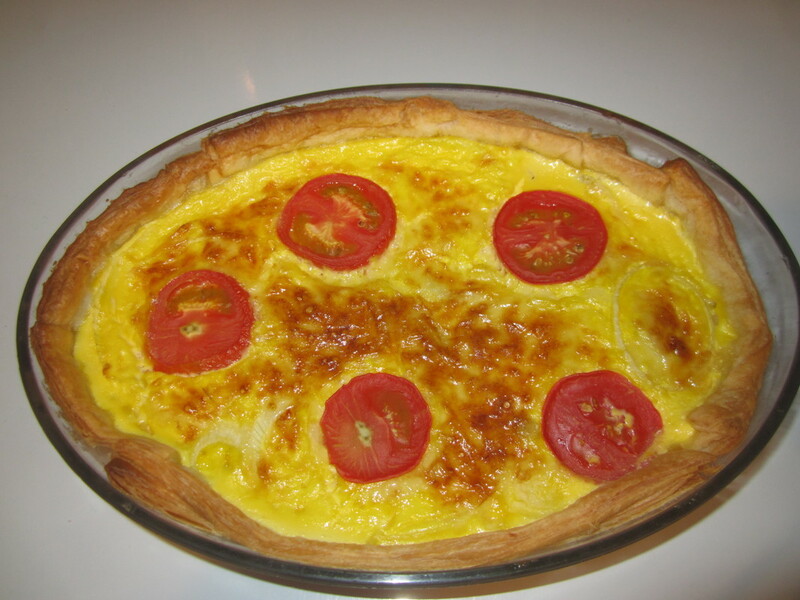 ​We had a shared lunch at church today, so I made a banana cake from frozen bananas, and a quiche which used up some pastry from the freezer, and some of my abundance of eggs. Both were quickly devoured! 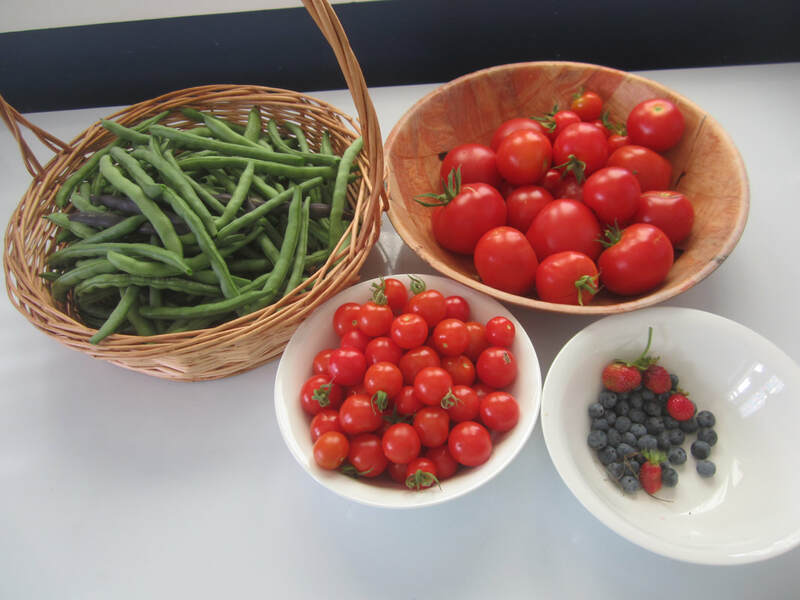 This week has been super busy in the office, so the garden has been mostly about some harvesting, a little watering, and a bit of admiring :-). I really need to get cracking tomorrow night and sow some seeds for the next batch of vegetables! 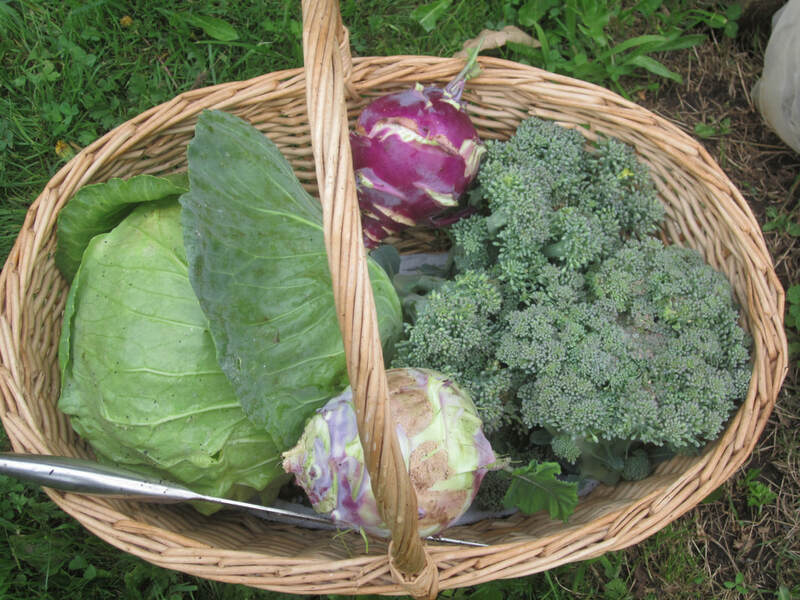 I picked a 3.5 kg cabbage, my first two kohl rabi, and some broccoli (all of which were used as shown above). I also pulled out a cauliflower plant that was completely covered in aphids - normally aphids attack only weakened plants, and so I decided this one could just go. Another cauli is hearting up nicely, so I bent some of the leaves over it to protect if from sunburn. 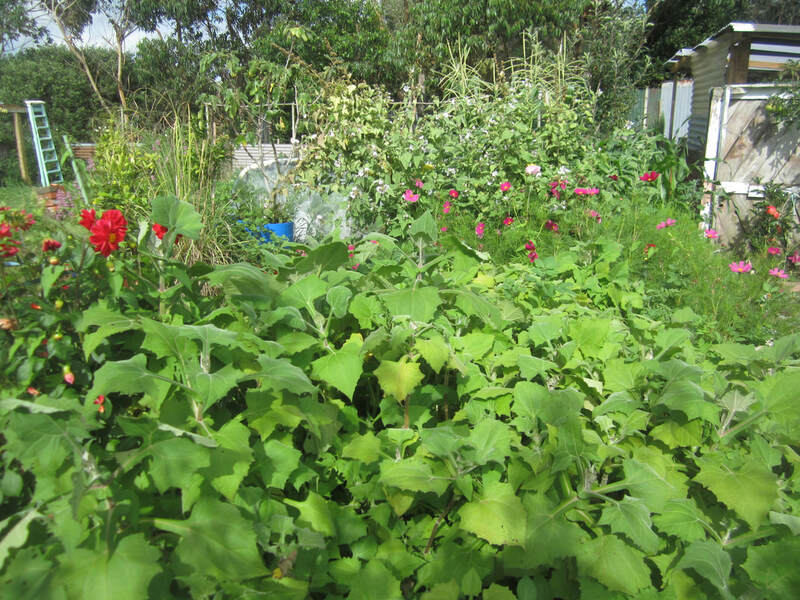 These two large plants at the back of this patch (below) are marshmellow in their second year of growth (6-8 feet tall). 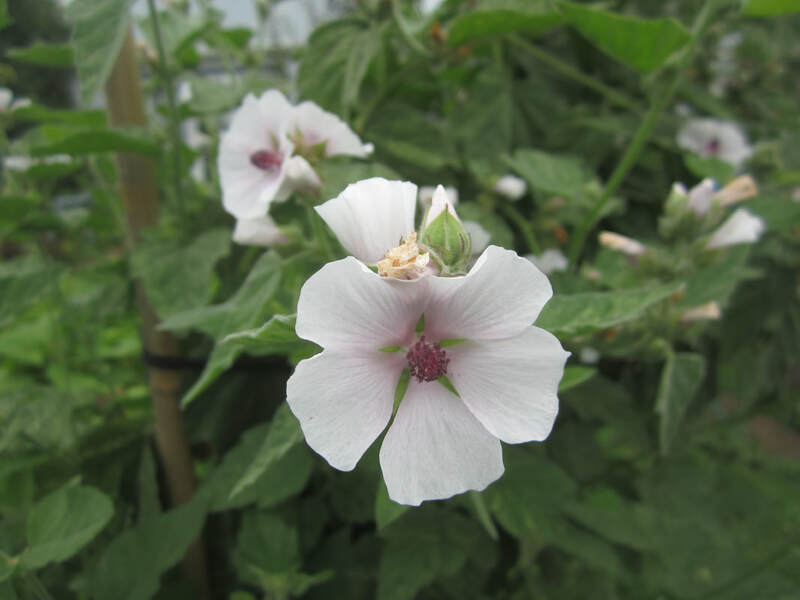 One harvests the roots after three years to use to make genuine marshmellow, or for medicinal purposes. I've never grown it before, so fascinated to see how big it will get next year! 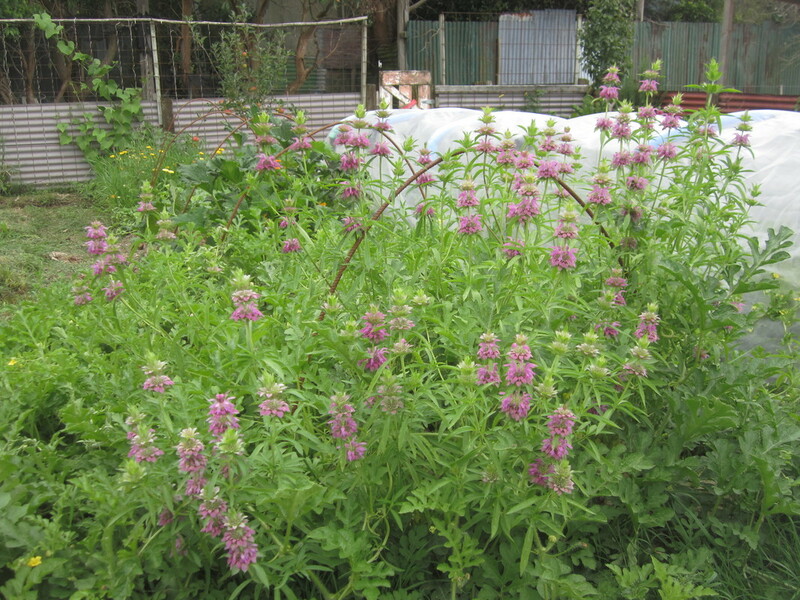 Last year they were a few stems with flowers, up to a metre high. Died off completely in winter. To the right is a close up of the flowers. 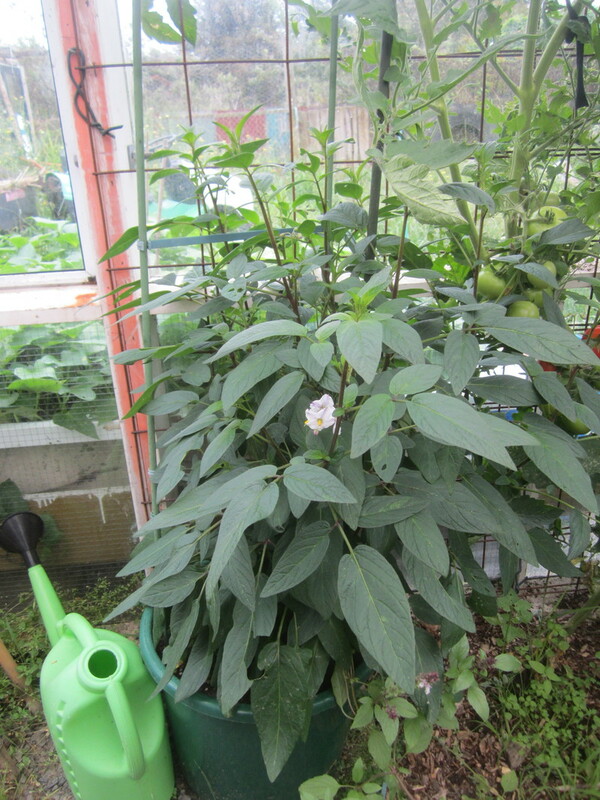 In the foreground are yacon, and behind them cosmos. 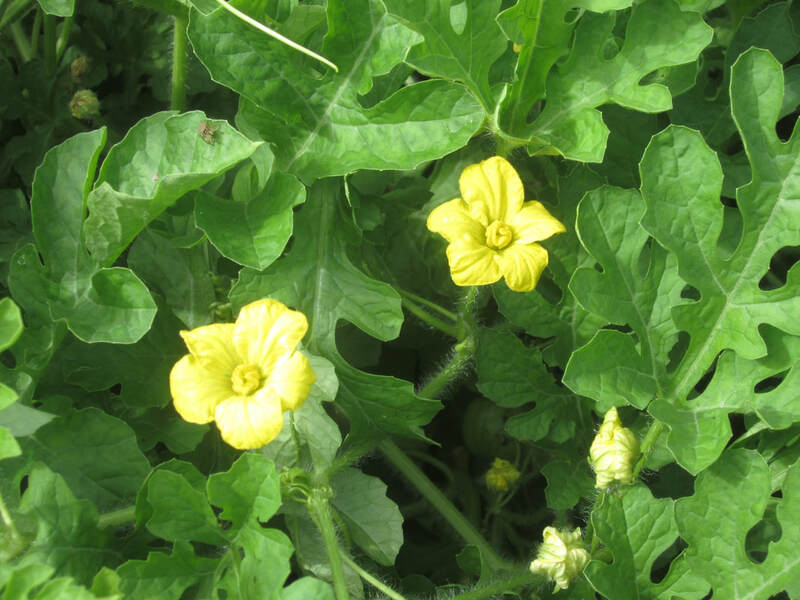 The lemon bergamot (pink flowers below) at the front of my watermelon patch is flowering. Another first for me. The bees love this stuff. 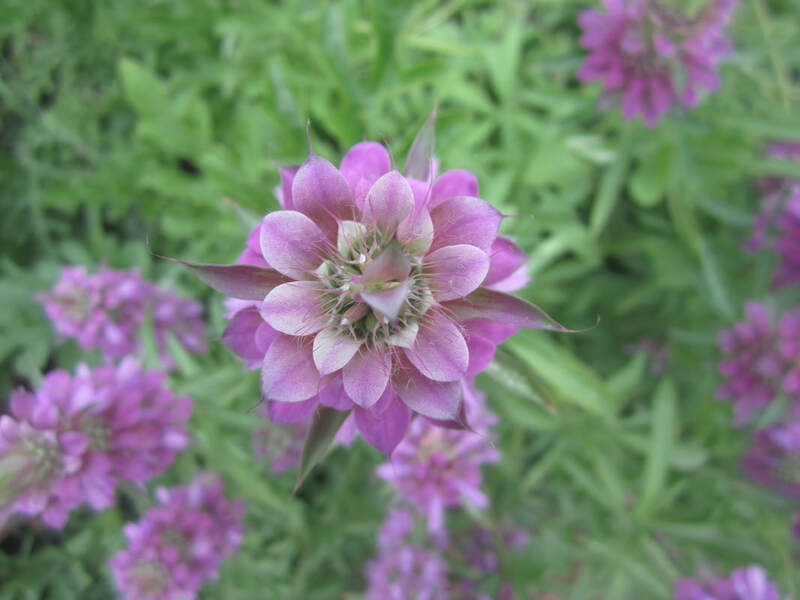 In fact, both the bergamot and the watermelon flowers are attracting lots of bumble bees, honey bees, wool carder bees, and drone flies currently. All great pollinators. 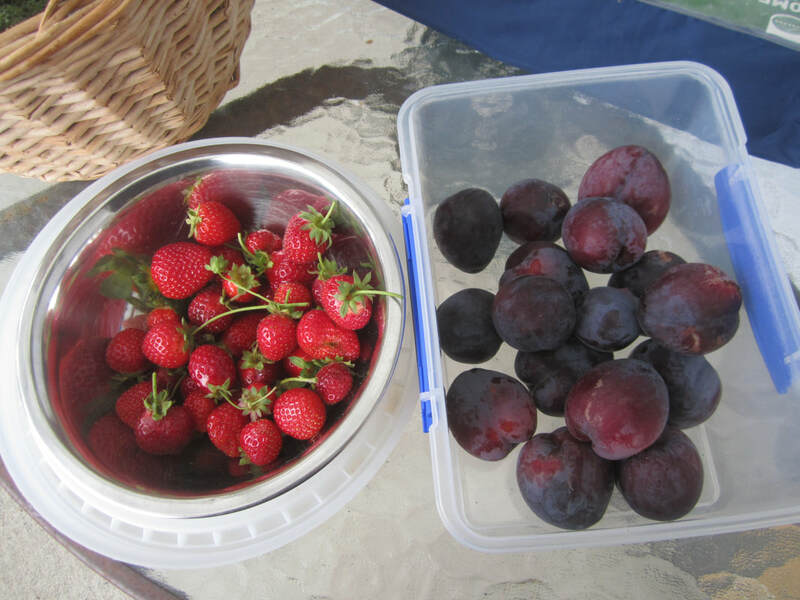 And I've been steadily picking plums, blueberries and strawberries. The first of my purple climbing beans are ready. I suspect some of them will be a challenge to pick, as they're climbing up the sunflowers, the tallest of which topped out at 3.85m! 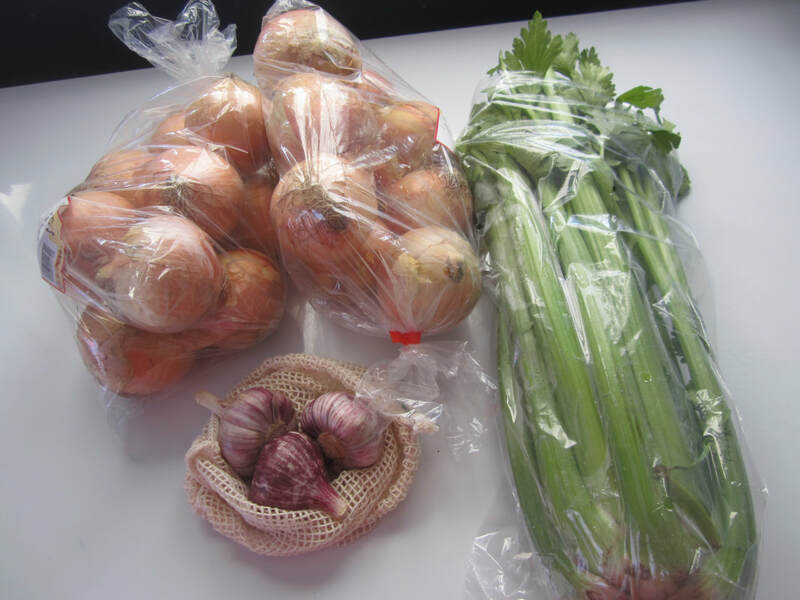 I was going to easily get through this week without spending a dime, but on Saturday I decided I really wanted to make some of my delicious pasta sauce, and needed some garlic, onions and celery for it and a couple of other things I want to make. So I went ahead and brought those - cost $14.22. 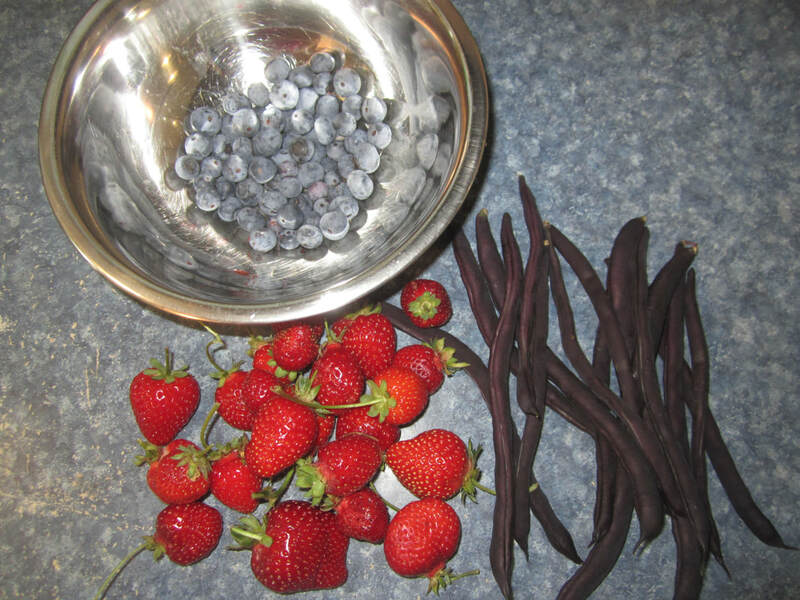 I could have got them less from the market garden in the next town, but since neither of us were going that way for anything else, it wasn't worth the drive. Clothing pegs: Keep a small jar of spring pegs in the kitchen - they are a quick and easy way to seal up opened packs of food. 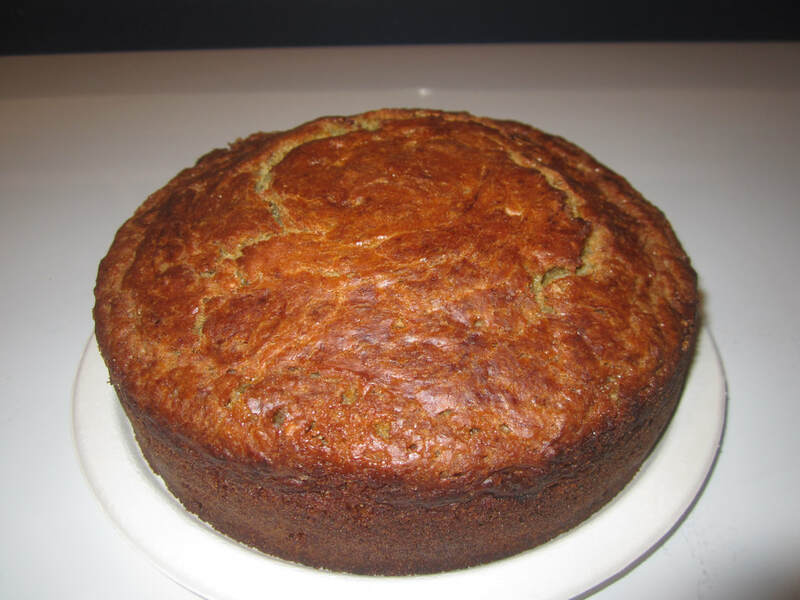 Easy to see, clean recipes: I keep my personal recipes in sheet protectors in a binder. When I want to use one, I take it out and hang it using two pegs onto a stretchy wire such as is used for net curtains, which stretches across my kitchen window at eye level. The recipe is right where I can see it while working, and it doesn't get any splatter, or is easily wiped clean if it does. Best ever drying rack: If you have high ceilings, suspend a rack or the side of a child's cot on pulleys from the ceiling. It's the perfect place to dry laundry in winter, or hang up herbs, seed heads etc to dry in summer. Easily lowered into reach to load, and then pulled up out of the way to hang in the warmest part of the room - near the ceiling.